Sitting on the front porch step is my favorite way to take in the front garden. 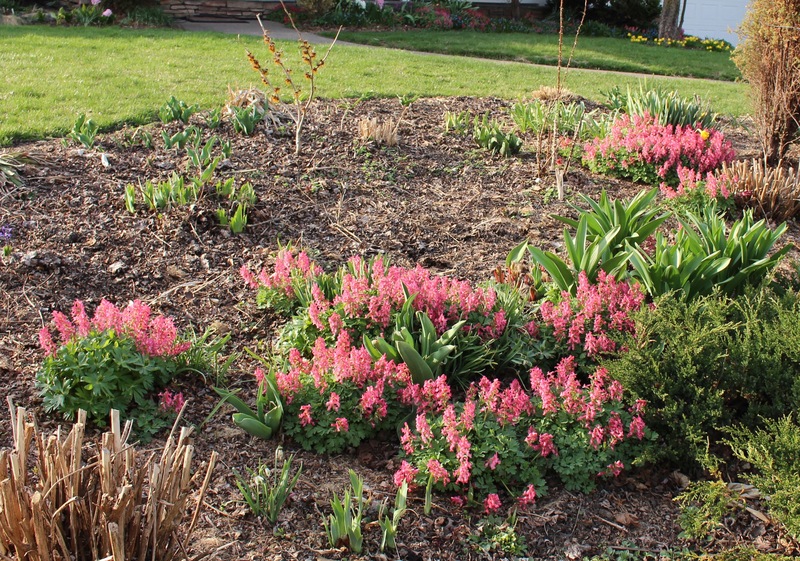 Right next to the step is where I plant many of my smaller treasures, but in the past couple years the pinks and mauves of Corydalis solida seedlings have started to crowd out just about everything else. 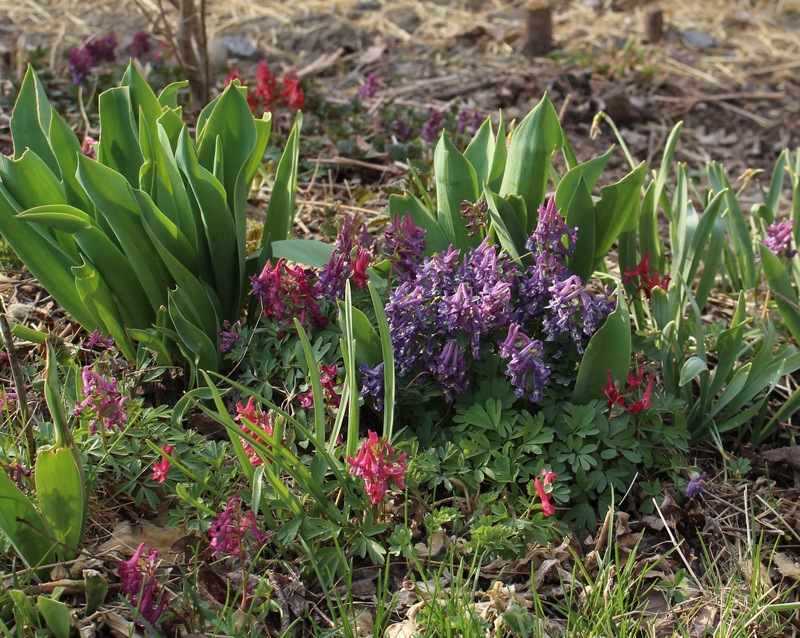 Depending on what the thermometer does we’re just a few days away from bunches of hyacinths and the earliest masses of daffodils, but for the moment Corydalis solida dominates the front garden. Corydalis solida ‘Beth Evans’ spreading out along the street border. It’s a lot more pink than I prefer but after months of brown and snow who cares. I’d have to look, but it’s only been a few years since I planted about 15 tubers each of pink ‘Beth Evans’ and redder ‘George Baker’, and from there on they’ve exploded across the garden. 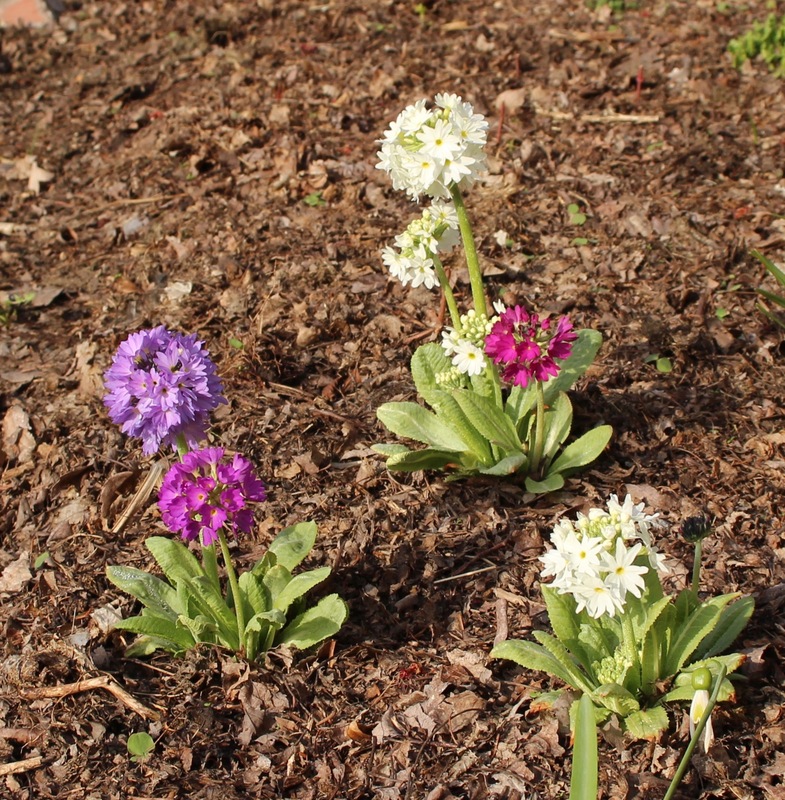 They seem to enjoy the better-drained garden beds, in particular spots where other perennials will come up and cover them after they go dormant in a few weeks. Restraint is not something I think of when these come up, and if you’re of the type who prefer a more ordered garden I would highly recommend avoiding them. Corydalis solida does its own thing and if they’re happy in your soil you’ll have them showing up everywhere. A weak attempt at adding named varieties has left me with just one survivor… and possibly a bunch of just-as-good seedlings. Keeping named plantings “pure” requires much more diligence than I chose to pursue so of course I just let them go. In a few days all this color will fade away and the plants will quickly ripen seed and shrivel away to disappear underground for another 11 months. If I’m on top of things (which has NOT been the case so far this year) I’ll dig a few of the more crowded clumps and tuck them in to all kinds of new territory… or just do it accidentally in August when I dig up a shovel full of the little round yellowish tubers. 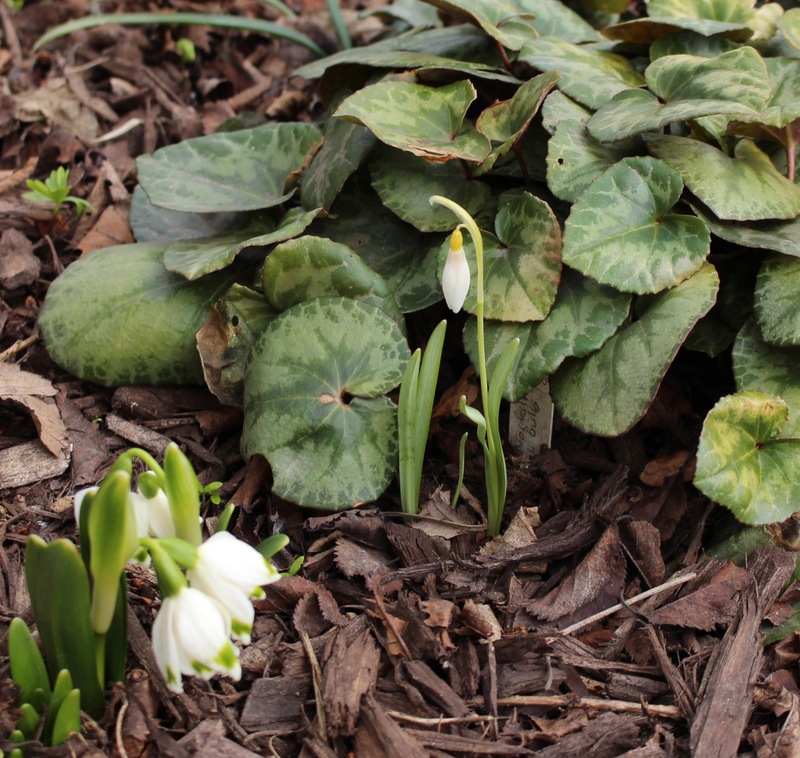 In the meantime here are two other surprises from the earliest of spring garden. Drumstick primrose (Primula denticulata) were a steal off the late fall clearance rack. I have no idea if they’ll last more than a year, but right now I’m thrilled by how early they are and lucky I was to find such well-grown plants. -Thanks Perennial Point! Near the shelter of the house the hyacinth have started. 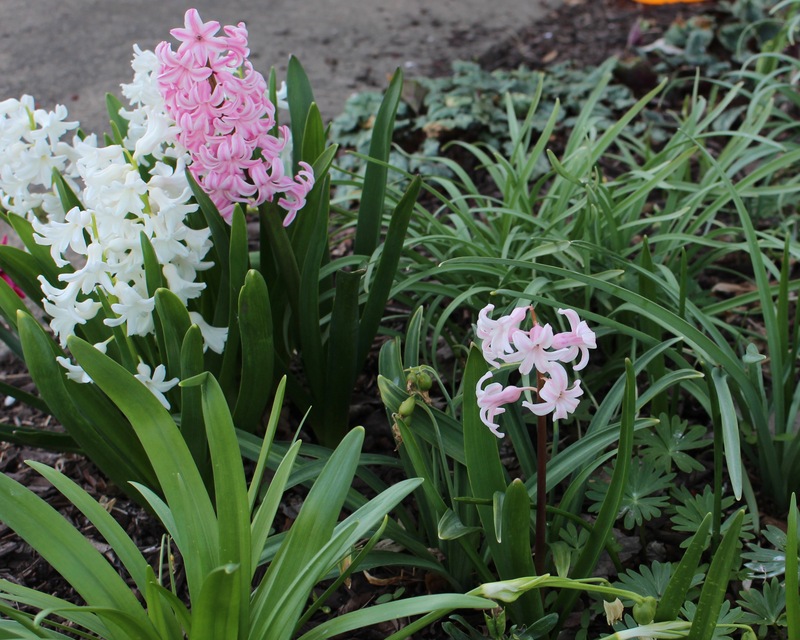 This wimpy, washed out pink is my most exciting hyacinth ever since it’s the first to flower of a bunch of seedlings off the clump to the left. Six or seven years is all it took which sounds terrible but since I never did a thing for them other than leave them alone it hasn’t been bad at all. Pink. My favorite color. Still it’s my firstborn hyacinth and I love it, and look forward to seeing how it develops over the next few years. So that’s it. Spring is exploding so that’s really not even close to what’s going on, but like you I’d also rather be in the garden versus on the computer so off I go! Hopefully after missing most of yesterday for all kinds of events, and today for more events (and plenty of rain in the afternoon), something valid gets done in the garden before the work week returns, but you never know. I’m fine with just sitting around taking it all in. Plus, as I discovered yesterday, parts of the compost pile are still frozen so I guess we’re still just starting. I love the start. Have a great week! I took a quick trip out to Long Island NY last weekend and since it was just me in the car it was a very brief back and forth before the decision was made to sneak in a garden visit. 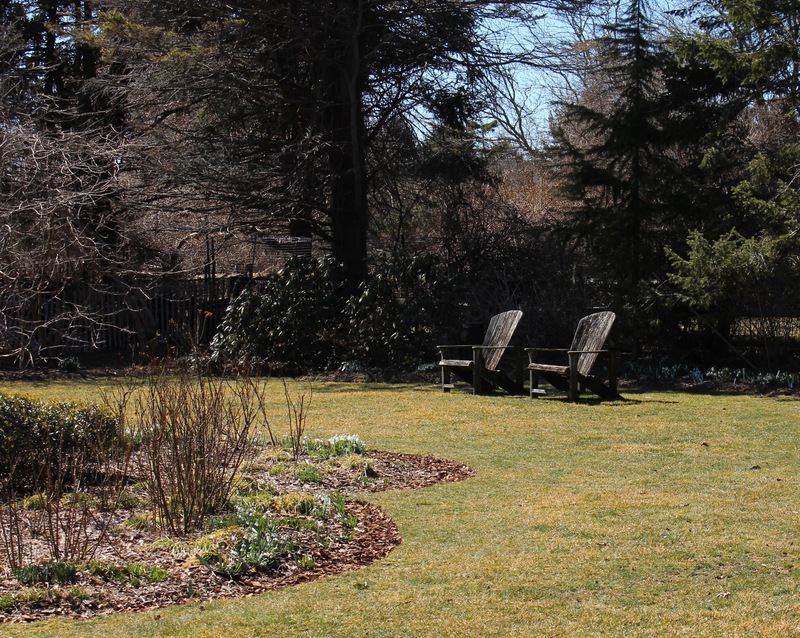 Planting Fields Arboretum in Oyster Bay, NY was the choice. 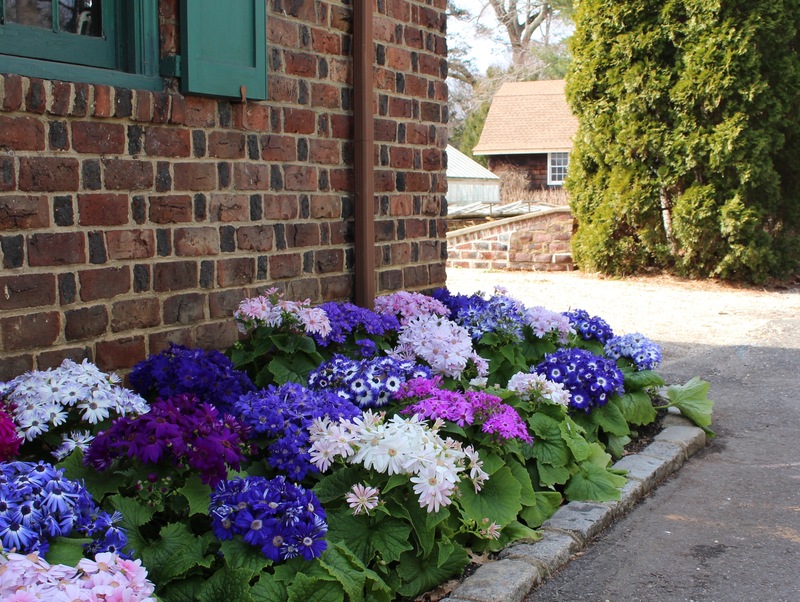 I didn’t know florist cineraria (apparently called pericallis these days) would be hardy enough to go outside already, but they were and they looked great in front of the annex building to the main greenhouses. Dark centered daisies are a favorite of mine btw. 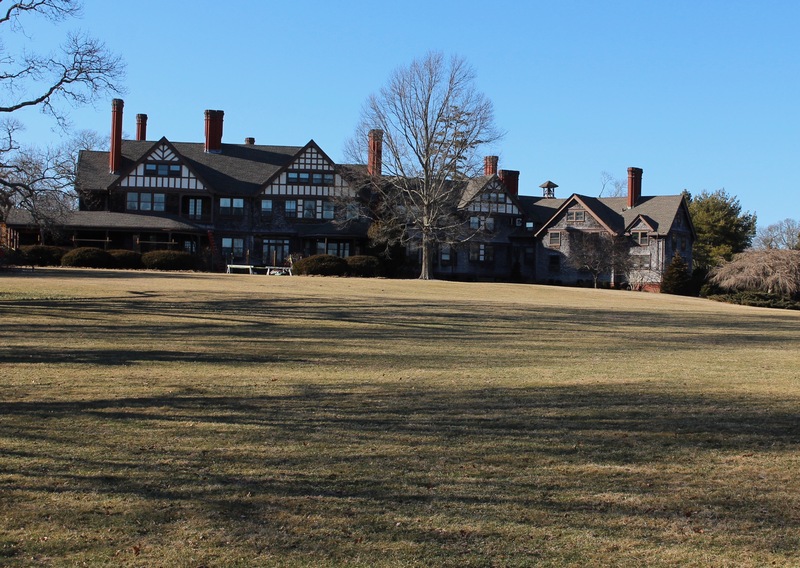 I used to work ten minutes from this NY historical state park and obviously because of the greenhouses, plant collections, hundreds of acres of open land, plus a manor house, you know it was a favorite pitstop along the way to and from work, but I had already been visiting for a few years before that. 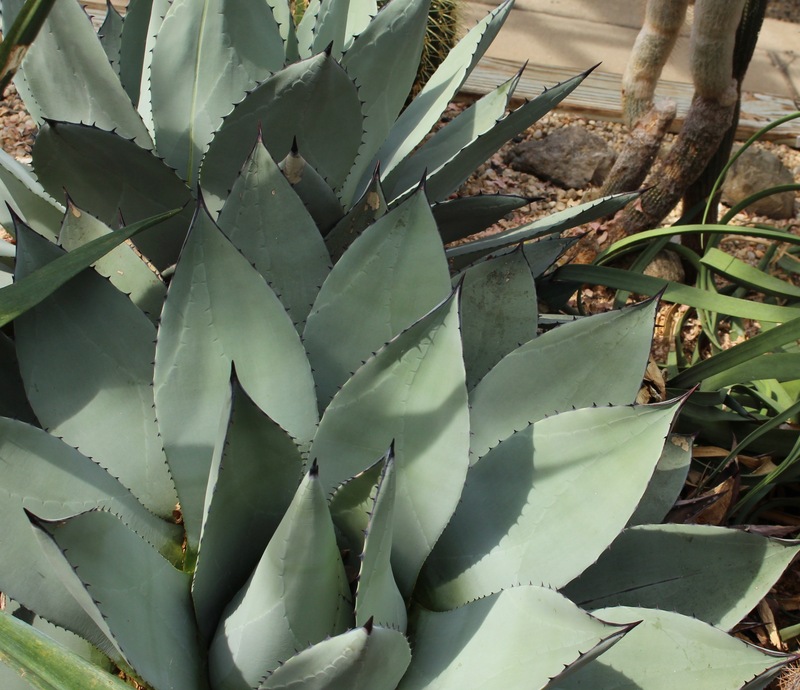 Over the years the visits have settled in to follow a traditional path, and that path nearly always begins in the main greenhouse. 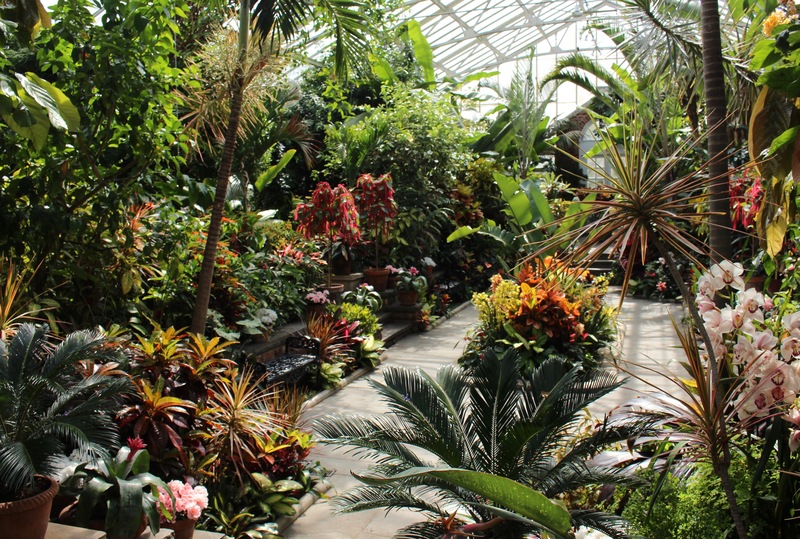 The Main Greenhouse at Planting Fields. 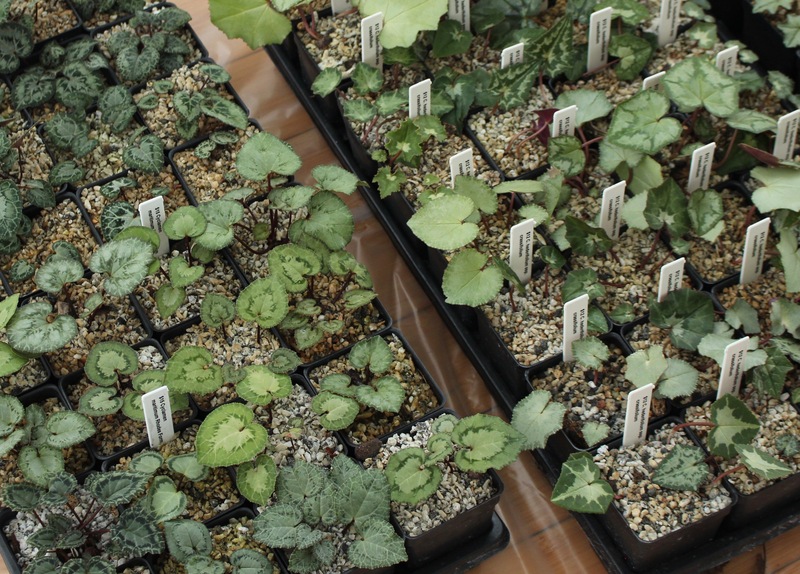 What shows up in the main greenhouse depends on the season or the year. 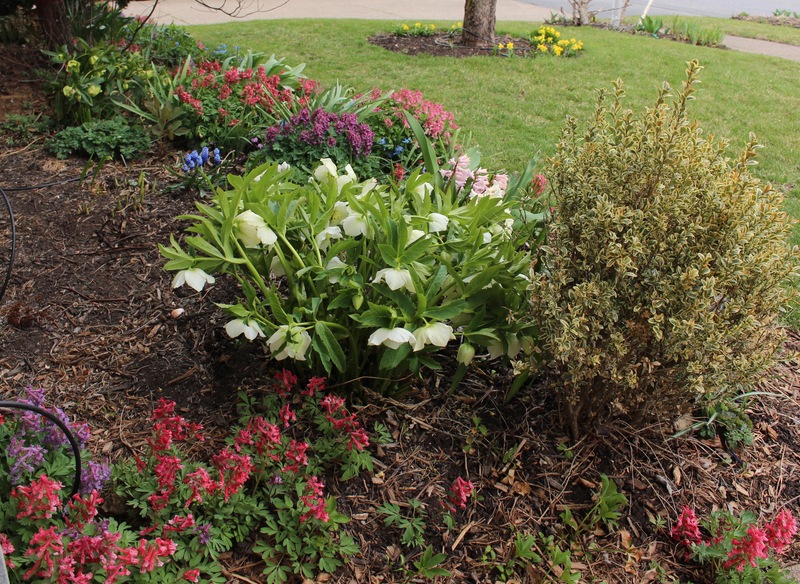 Sometimes the beds are filled with delphinium or foxgloves, poinsettias, chrysanthemum, orchids… wherever the mood of the planting staff has gone. This March it was overwhelmingly tropical. When you follow the outer path your way is completely enclosed by tropical shrubs, palms, trees… oranges overhang and starfruit grow alongside bunches of bananas. I believe in this photo we are looking up into a Bismarck palm. Radiating off the Main Greenhouse are several grow houses which back in the day served to supply the estate’s cut flower supply. 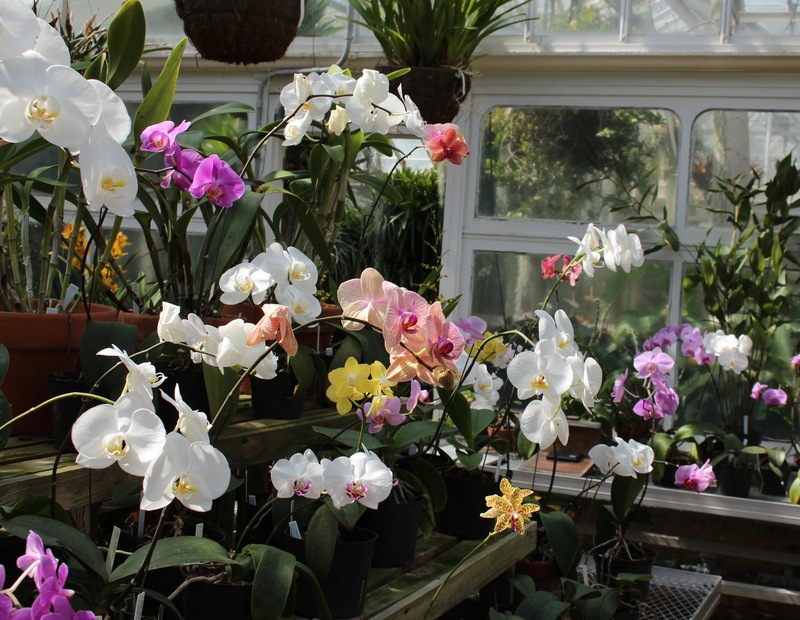 Several greenhouses are devoted to orchids. On this bench part of the phalaenopsis collection was still putting on their late winter show. Back a few years ago, more of the greenhouses were accessible but today there are still at least six of the side greenhouses open for visitors, and you can always find plenty to see. 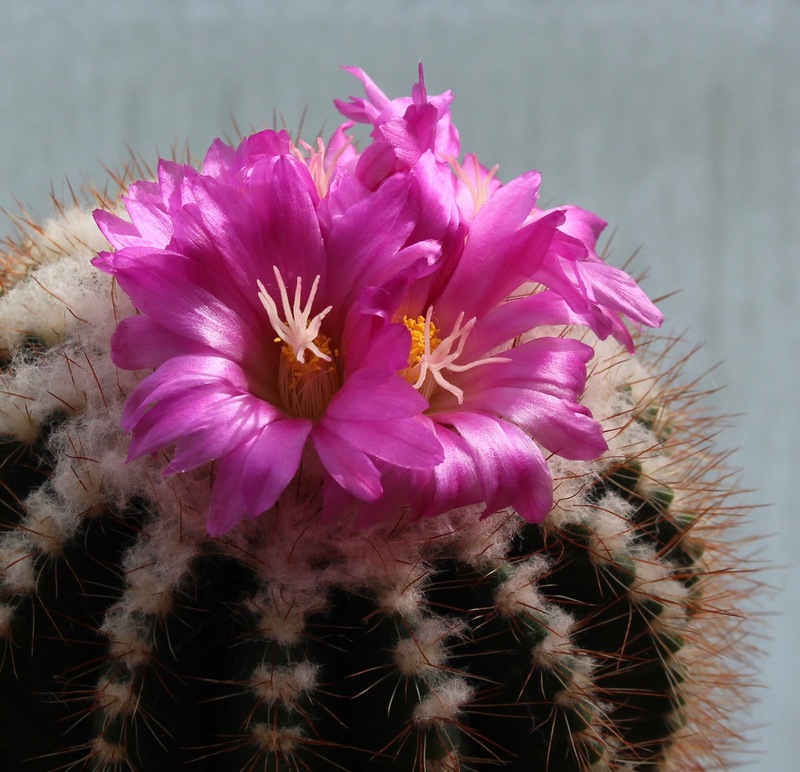 There’s always something special in the cactus house. I seem to remember one of the greenhouses being a fern house. 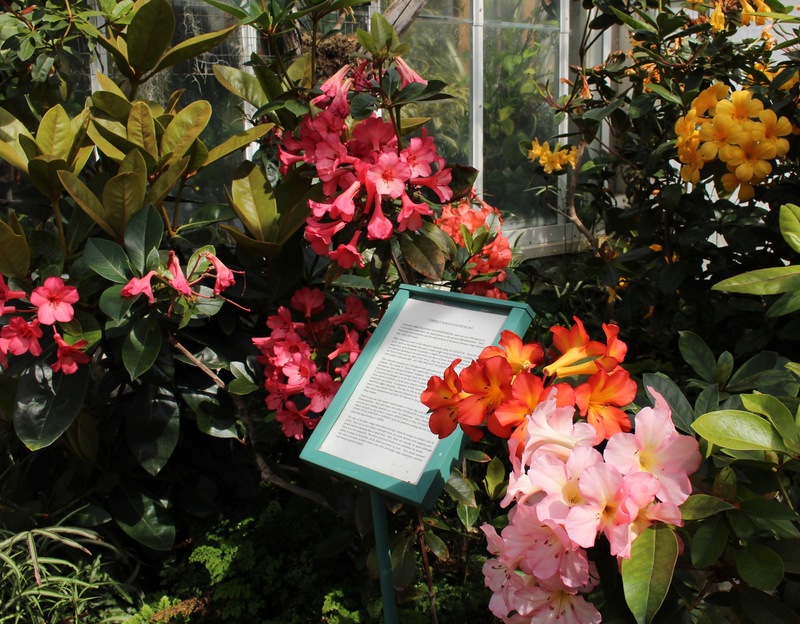 Imagine my surprise when these bright, tropical rhododendron greeted me through the next doorway instead. 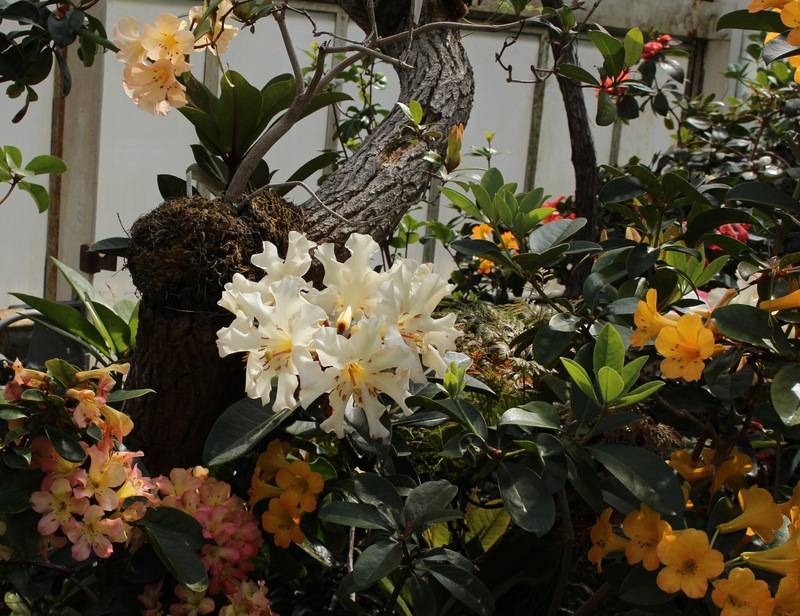 A few vireya rhododendrons in peak bloom. 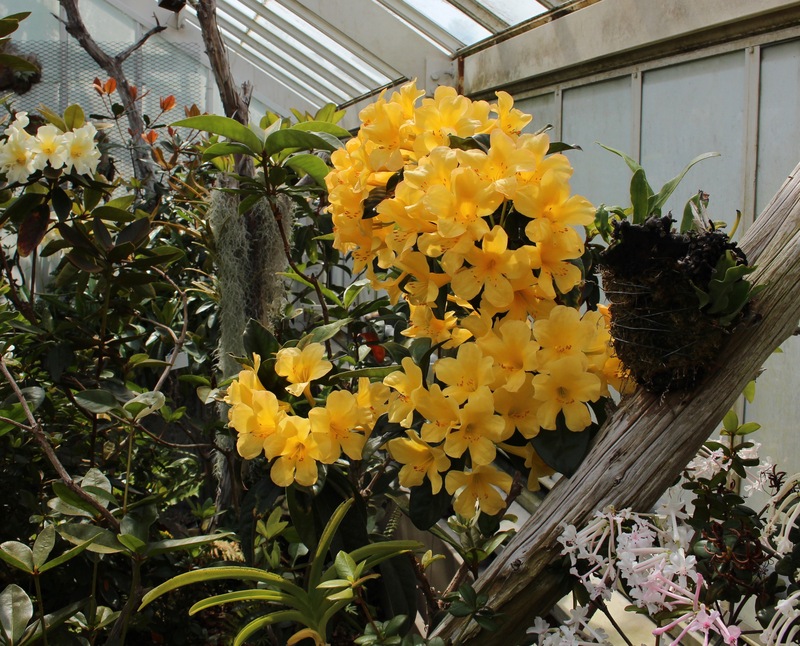 Vireya rhododendron represent a section of rhododendron which hail from the tropics of Southeast Asia. As you can see, out of the couple hundred species there have been quite a few exceptionally showy selections and hybrids. Just a touch of golden yellow. It’s so bright it almost overwhelms the smaller species to the right. Also, in case you’re wondering, my nose detected no scent although some say they’re remarkably fragrant. The spring sunshine made everything even better, but notice the mossy root ball behind those extravagantly ruffled ivory flowers. 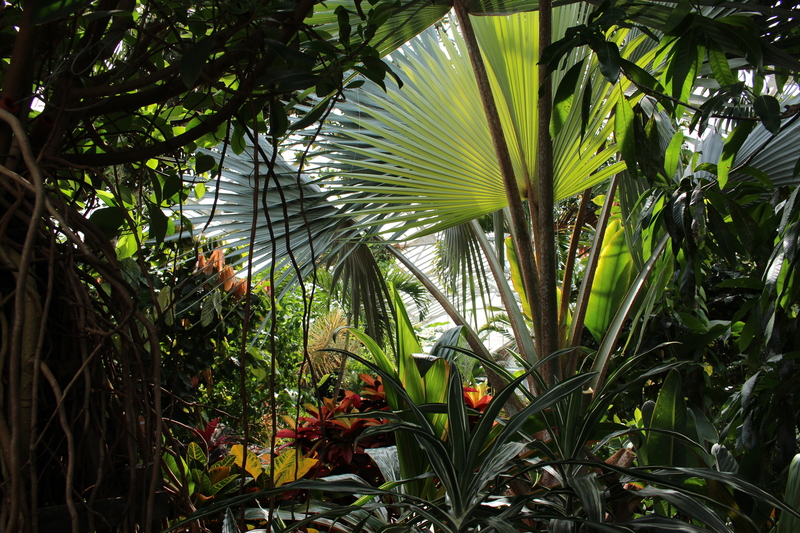 Many vireya are epiphytes, and grow up amongst the branches of the tropical canopy. Sorry but I thought the vireyas were exceptional 😉 Next on the agenda was a short stroll over to the camellia house. 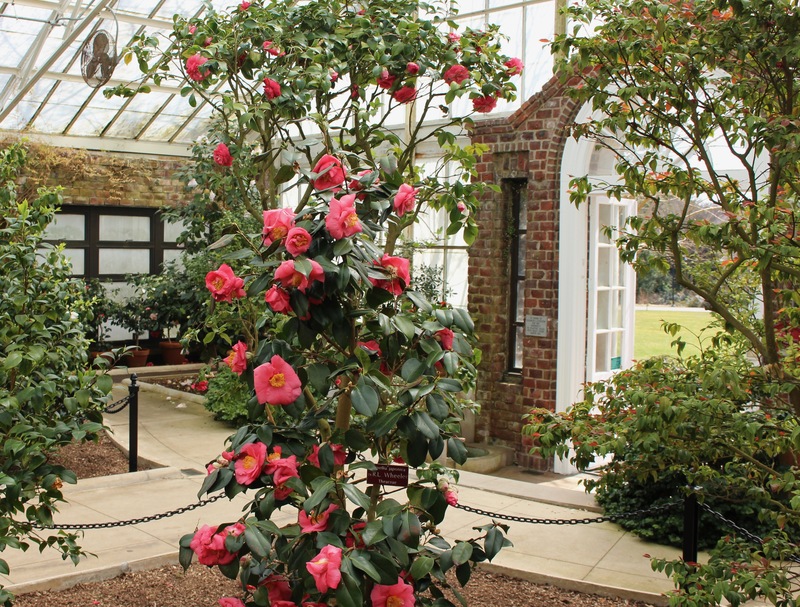 Side view of the Planting Fields Camellia House. This used to be shaded and blocked by massive beech and pines, but disease and storms can take a toll. 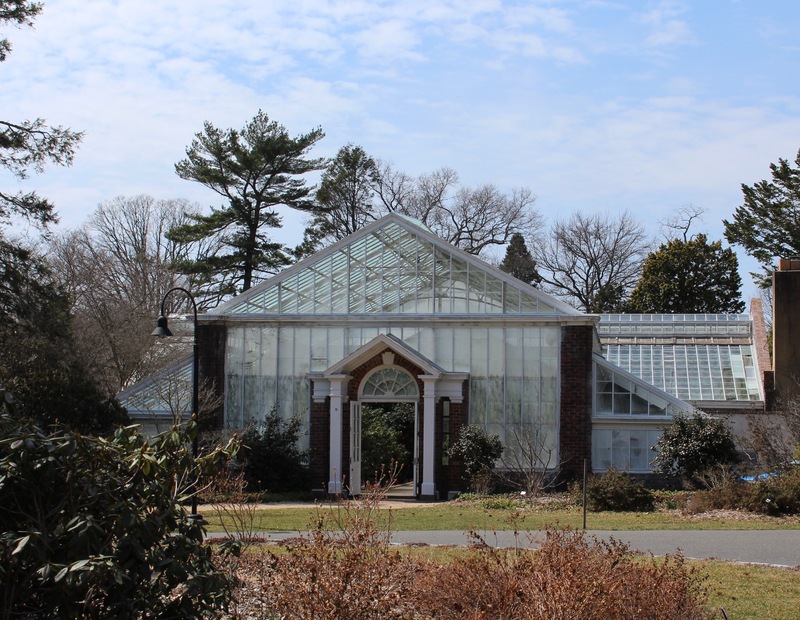 The camellia house (1917) shelters the largest collection under glass in the Northeast. I believe I once read that Mr. Coe got a really good deal on a bunch of imported camellias and only later discovered that they likely wouldn’t be hardy in his new garden. Build a new glasshouse was the solution! In any case, this year I managed to catch the tail end of the show. Camellia ‘Captain Rawes’. A small arching tree which used to be matched by another equally large tree on the other side of the walk. I wonder how long its partner has been missing, they were always my favorites. Here’s a little 1996 NY Times article on the camellia house. 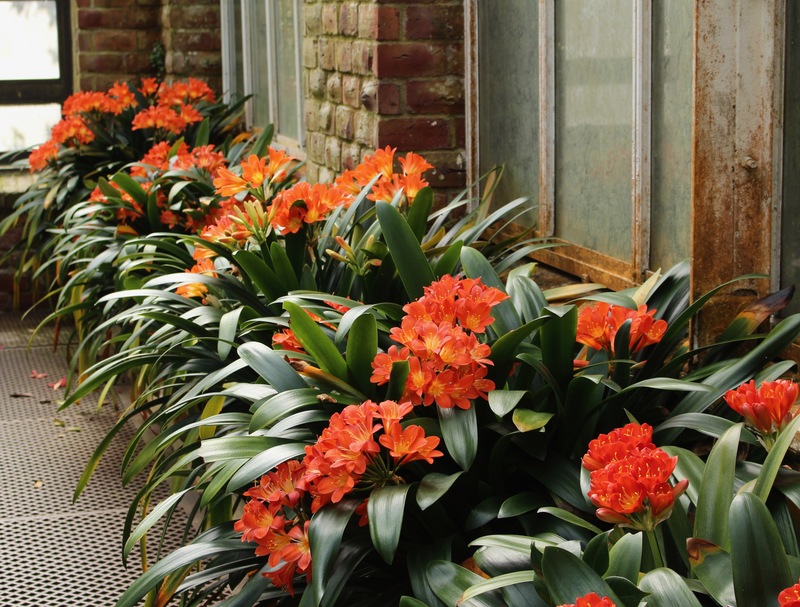 Although many of the camellia were over, the clivia were coming on strong. 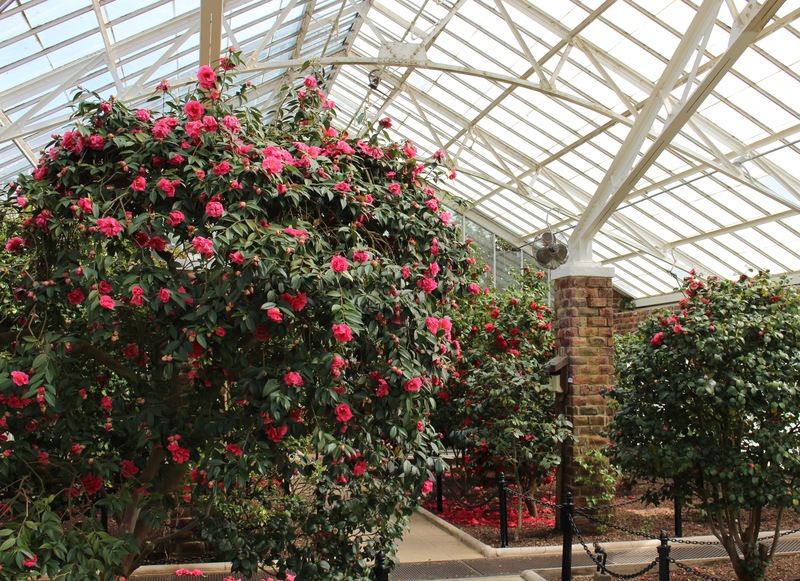 The camellia house is another place which comes and goes. Some years it’s a thicket of bloom and bush, other years it’s recovering from the occasional massive pruning these big plants need. I guess this year was somewhere in between, still excellent of course. Southerners would probably pass right by this one, but here in the cold north these huge flowers made me smile. Plus the brickwork and greenhouse doors aren’t all that shabby either. A brief run through the grounds was the next requirement. 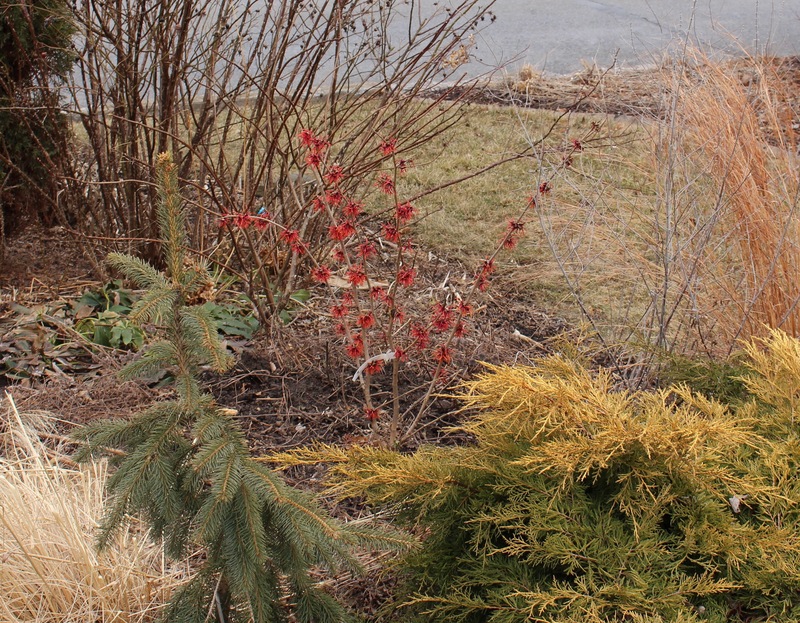 The mixed perennial borders surrounding the pool were still 100% sure spring had not yet arrived. William Coe built Coe Hall as a residence, but his botanical collections and interest in horticulture had this former gold coast estate donated as a school of horticulture, and then preserved as an arboretum. As such it’s filled with interesting things, and whether you’re just strolling or looking for specific plant goodies you can’t go wrong on a beautifully sunny March morning. Coe Hall beyond the branches of one of the remaining mature beech trees. I tried to get a quick visit in with all my favorites. The giant sequoia trees were looking sad, as it appears fungus has finally caught up with them, but I was happy to see the odd monkey puzzle trees were still up to their usual monkey business. 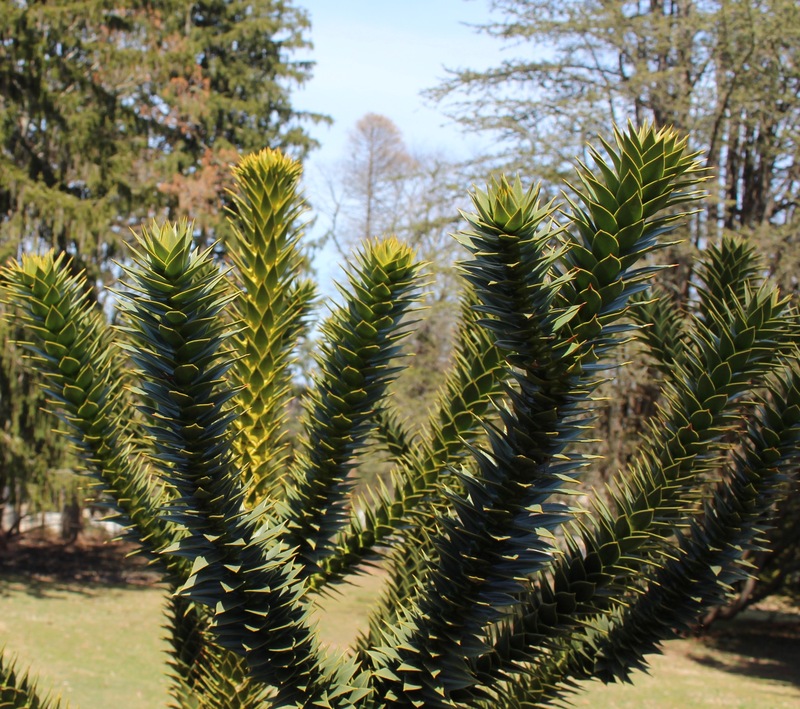 Monkey puzzle tree (Araucaria araucana) in the sheltered high shade of the North rhododendron garden. The monkey puzzle is an exceptionally curious thing, and ranks as one of those living fossil trees which still keep chugging along as if the dinosaurs were still around to graze them. Nowadays they’re confined to the Southern tip of South America but eons ago ranged across continents. 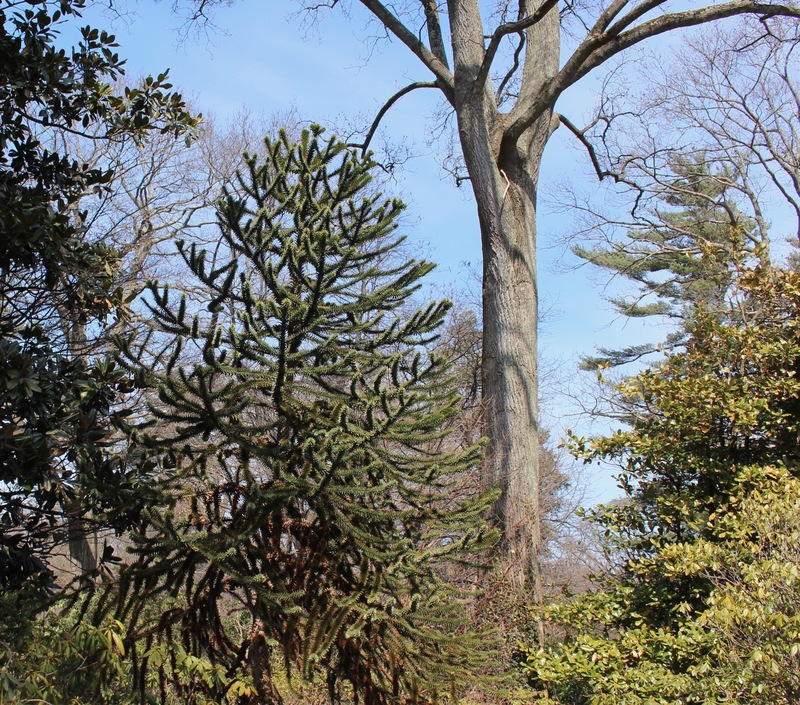 Spiny, sharp, and a puzzle for any monkey to climb, Araucaria araucana is not for everyone. The foliage is cool though, and individual leaves can stay on the plant for decades. Trees over 1,000 years old are not unknown. Of course I still found plenty of late season snowdrops. So that was last weekend. Maybe you can guess that in the week since I’ve been busy and/or lazy again, and if that’s a bad thing well at least on the good side it spares you from much of the rest of our snowdrop season. It was an ok year in case you’re curious. Too much wind, a lot of temperature ups and downs, and last year’s monsoons seemed to have been too much for many of the plantings, but hopefully the snowdrops which did come up will be enough to last until next year. Better late than never… and although Paula and I did meet up for a February greenhouse tour of snowdrops, that visit was a far cry from our traditional all-day snowdrop adventure. Fortunately we were able to get one in. This trip was a check off the bucket list, and it involved a four hour drive in a completely different direction, with us getting out of the car just short of the Eastern tip of Long Island, NY. Understandably my wife told us several times we were crazy (although she did use slightly different terms). Treasures tucked in under the shade of a southern magnolia. 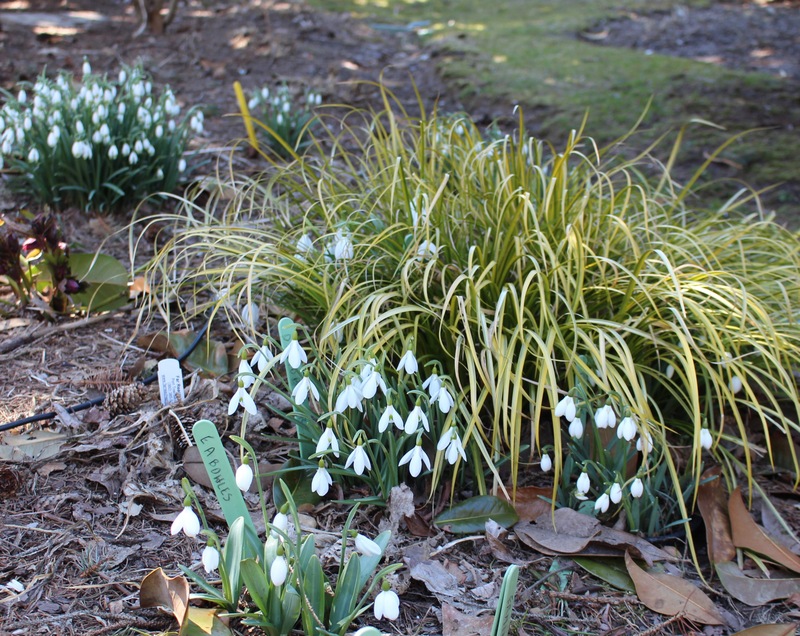 Galanthus ‘David Baker’ sits next to what I think is a golden variegated sweet flag (Acoris gramineus ‘Ogon’). We had been hoping to visit this garden for a few years now, and the more sane version started with me heading East for a visit with my parents, Paula driving out the night before, a one hour ride to the garden in the morning, and then wherever the weekend leads after that. Of course other obligations interfered and once again the plan didn’t work out, but our host was exceptionally accommodating and so was the weather, so tally-ho! 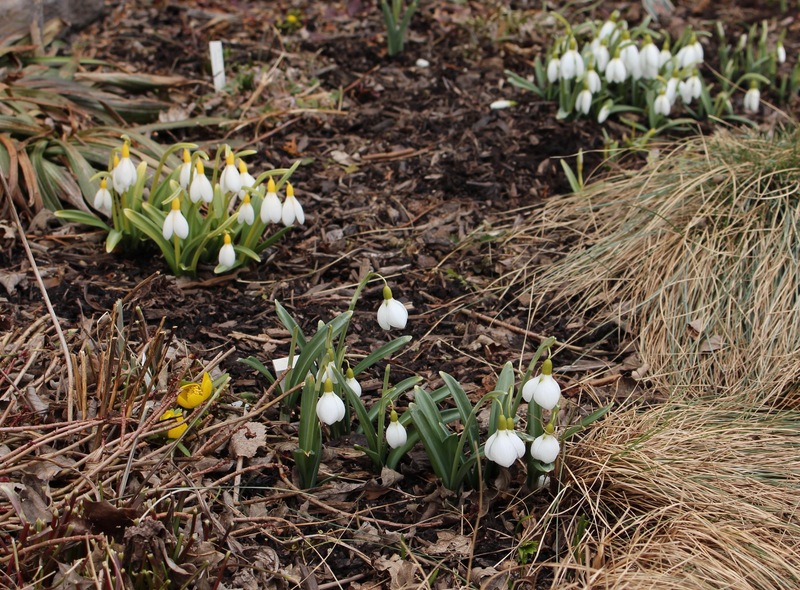 Snowdrops were peppered everywhere in this mostly sunny garden. Our host kind of confessed he’s pushing several hundred cultivars, so ‘everywhere’ does end up being a necessity! This was the garden of a true galanthomaniac but still remarkably balanced. 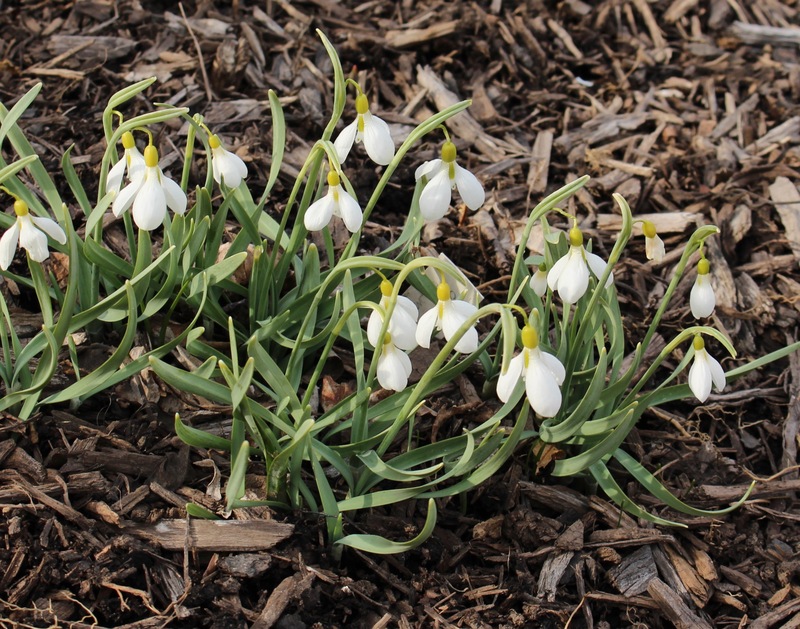 Roses, perennials, evergreen plantings, interest for all seasons but still space for tons of galanthus! Not the best photo, but I do like galanthus ‘Green Tip Richard Ayres’. I like it a lot. This is a garden where the majority of snowdrops were planted in pond pots, a plastic mesh pot used for aquatic plants, but also embraced by serious snowdrop growers as a way to cram tons of cultivars into a small plot yet still be able to lift and divide and find bulbs easily. 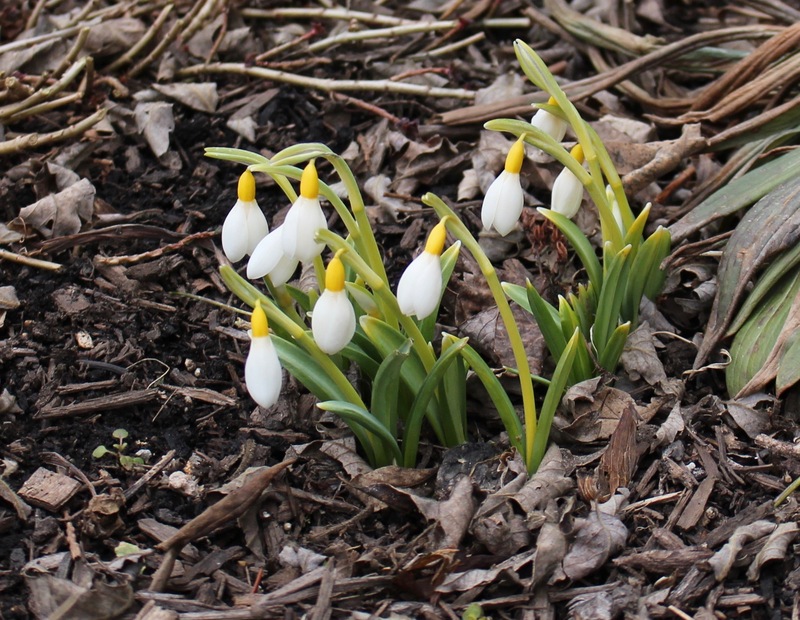 Even when the dormant bulbs show nothing above ground. It makes a lot of sense and the results do speak for themselves. 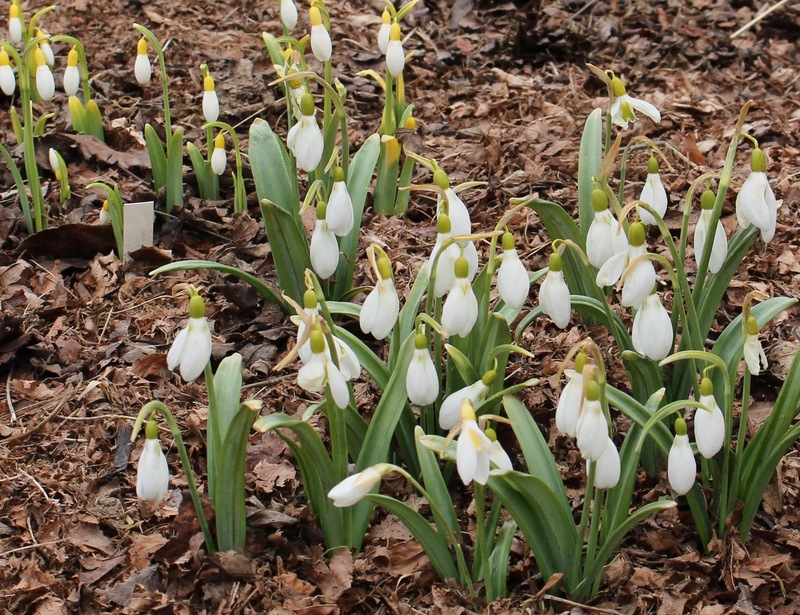 The shade of conifers is usually not good at all for spring bulbs, but on the edge of a sunny lawn with just a few sheltering boughs above, galanthus ‘Godfrey Owen’, ‘Lady Beatrix Stanley’, ‘Little Ben’ and others, are all quite happy. Galanthus ‘Natalie Garton’ (aka ‘Chris Sanders’) soaking up the March sun at the edge of the rose garden. Note the brown label off to the right, that’s our host’s sign that this clump is marked for digging, dividing, and sale(!) this summer. I’m going to guess that years ago this gardener realized that when collecting, you can only really hold on to so many of any given cultivar. You can also only trade and give away so many, so for several years our host has taken to offering a few (actually quite a few) each year for sale. I’m going to foolishly direct you to >my snowdrop page< for contact information (scroll down about halfway to ‘snowdrop sources’ and you’ll see him listed by name)… although the selfish side of me is hoping you don’t beat me out to my favorites, and leave me with the leftovers since it sells out fast. While you’re requesting a list you may also wish to ask him about getting email updates from his annual UK trip each spring. 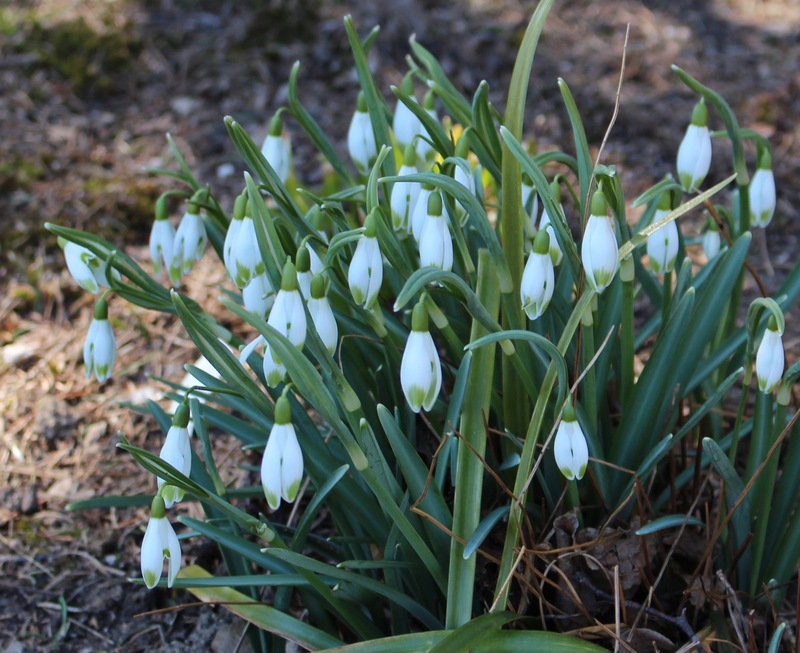 It’s a fun narrative of an A list of snowdrop events and personalities from overseas, and will help you steel through the last few weeks until our own season takes off. I’m sparing you from most of the endless stream of individual photos, but there was one more snowdrop which really stood out for me. Under the pergola a monster clump of elwesii caught my eye even from across the garden. Well over a foot high, with wonderfully large flowers that still held a classic grace, this was one more snowdrop for my growing list of favorites. I don’t know what the plans are for this one, but I made sure to drop plenty of hints that I’d like to be on the waiting list! Galanthus elwesii under the pergola. Sorry about the lighting, but as you know I’m more enthusiastic than skilled. I hope I pre-warned our host sufficiently that we would surely overstay our welcome, but even after two hours plus of garden wandering he still graciously extended us an invitation for tea. 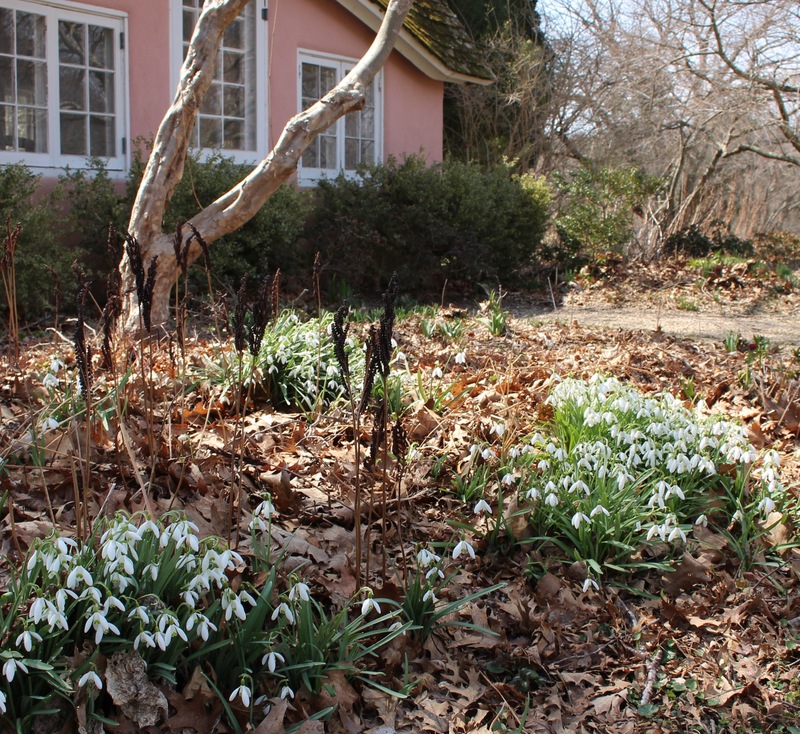 Our host wisely excused himself midway to get some inventorying done while we photographed, but we found him anyway and the warm shelter of the juniper hedge made for a perfect spot to enjoy snowdrops and sun while talking galanthus. 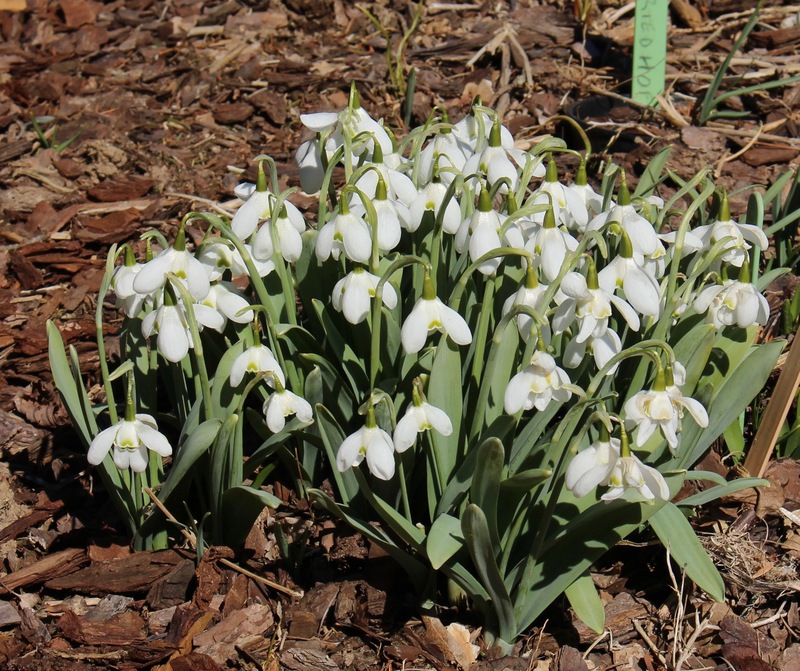 Ok. One more, Galanthus ‘Bernard Rohlich’. Note the brown label, hopefully my budget can handle this one! So finally it was inside for tea, which we probably overstayed as well, and then out the door. Our host was still kind enough to offer us more garden-wandering time but a long drive home was hanging over our heads. We headed out to the car but not before one last pause to admire all the galanthus ‘viridapice’ clumping throughout the garden. If I remember correctly these were the drops which started most of the obsession in this garden. 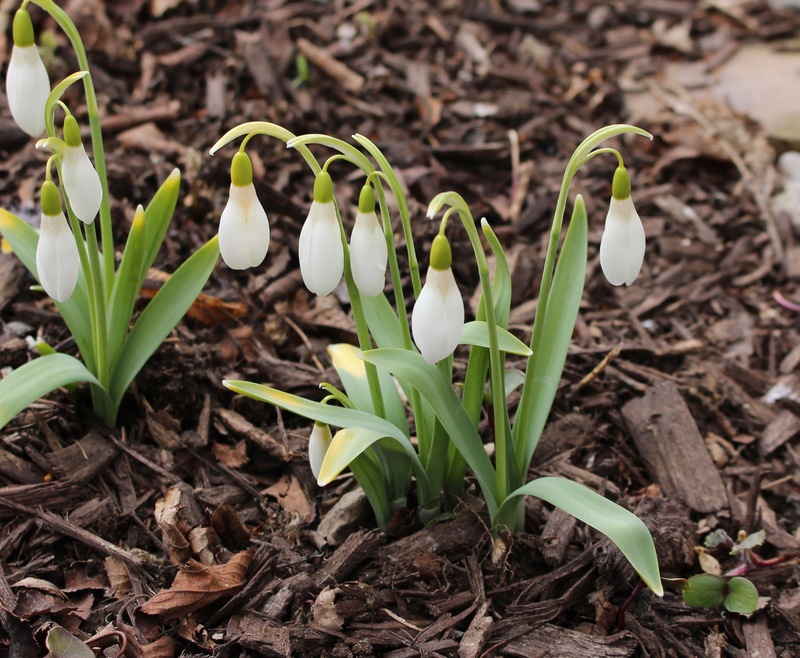 A pack of bulbs simply marked ‘snowdrops’, and thirty years later (and a lot of luck to get such a nice form of viradapice in that pack!) and the garden has drops all over. 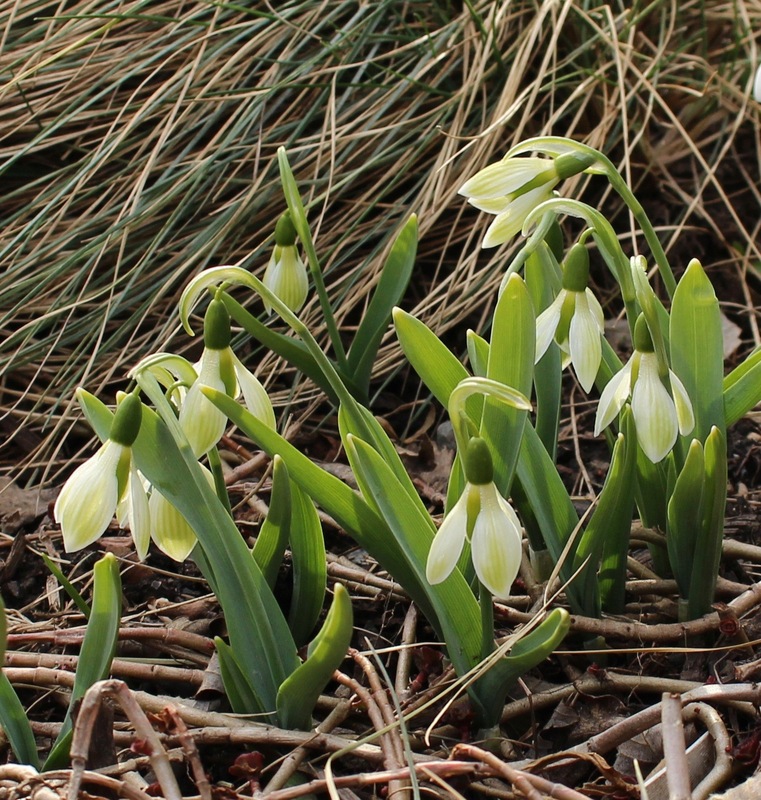 Just one of many, many healthy clumps of galanthus ‘viridapice’ growing throughout the hedges and woodland plantings of the garden. After we said our goodbyes we began the journey back west. Of course there was a side-trip. 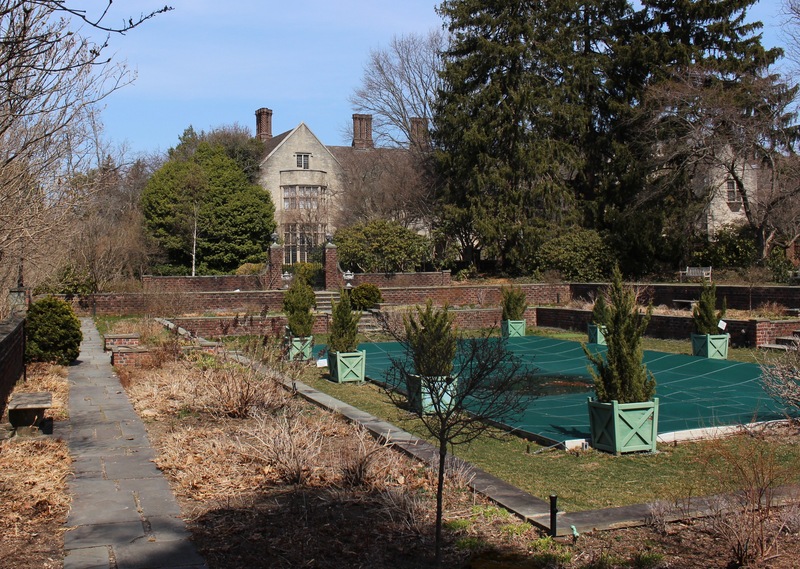 With 40 minutes to go till closing we popped into the Bayard Cutting Arboretum for a quick run through the snowdrop highlights of this former estate, present day NY State park. 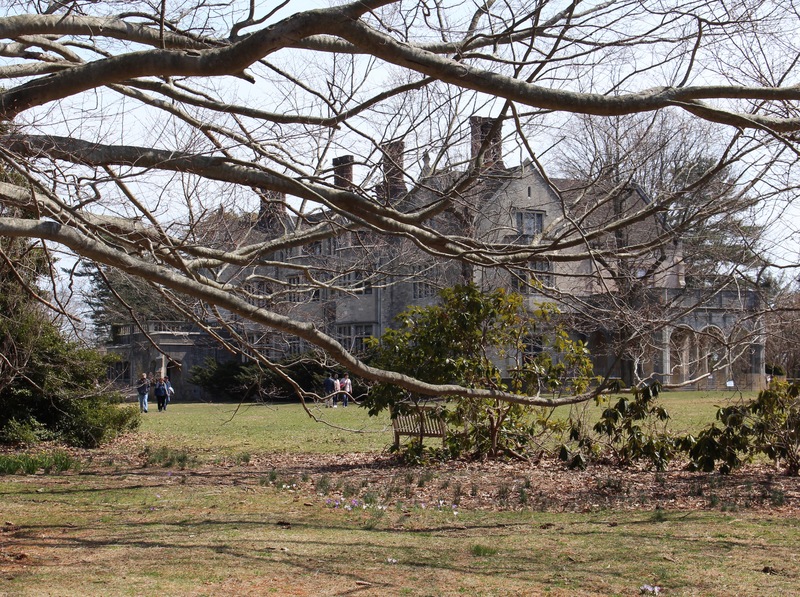 It’s an old manor house property which dates back to the late 1880’s and recalls Long Island’s history as an escape for the rich and famous of NYC. “Westbrook” overlooking the Connetquot river and estuary as it leads out to the Great South Bay on Long Island’s South Shore. This arboretum was one of my favorite off season destinations while growing up. 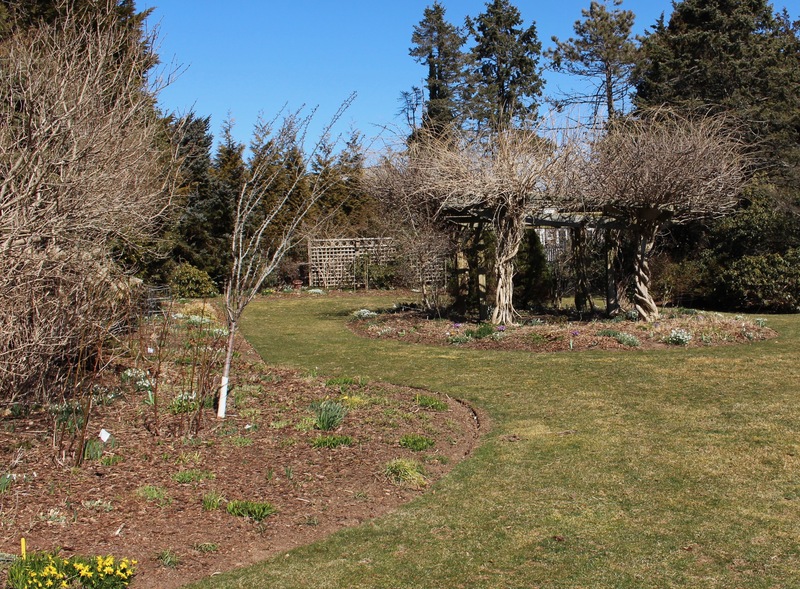 The coastal air and sun would usually keep the walkways clear of snow and ice, and the pinetum plantings and many paths and trails were always a nice outing. Since I’ve already mentioned I was a little weird as a child, I don’t think it will surprise anyone that I knew where many a snowdrop patch was located. 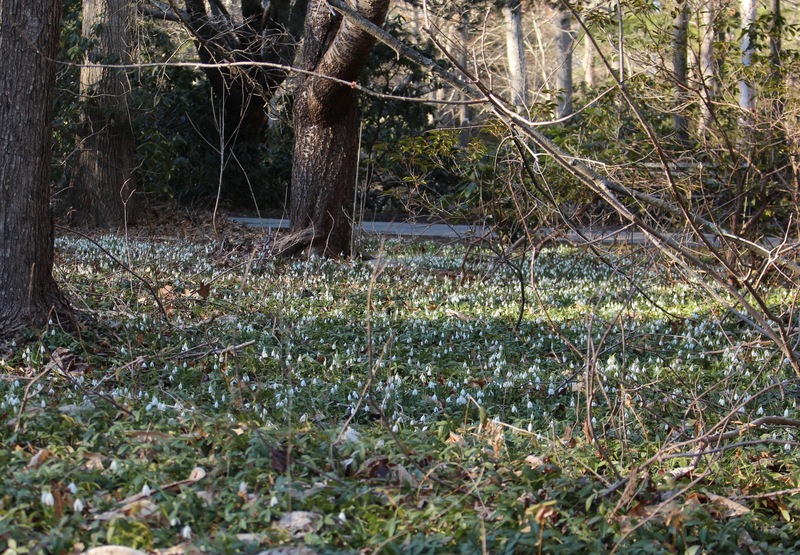 Naturalized snowdrops (galanthus nivalis) filling in amongst the vinca minor. We were quite satisfied with this stop. Not to date myself but over the decades many a change has come through here. 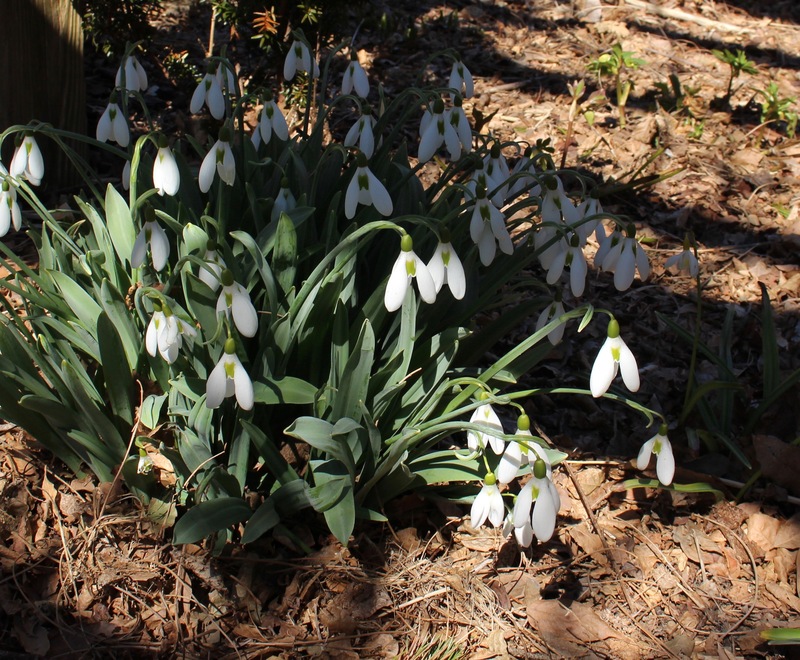 Hurricane Gloria in ’85 was probably the worst when it wiped out an awesome hundred year old conifer collection and closed the park for months, but saltwater flooding from Sandy in 2012 seems to have done in my favorite patch of giant snowdrops (g.elwesii). Still it’s a wonderful spot which I’m happy to see protected and accessible. 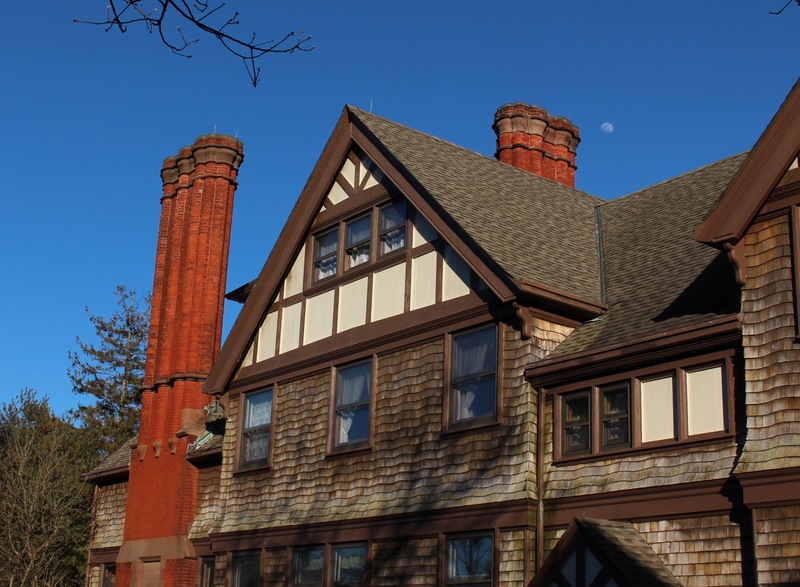 A maintenance moneypit I’m sure, but the Tudor style with awesome shingling and crazy chimneys puts the approaching worm supermoon to shame. Thanks again to our host for a very enjoyable visit, thanks Paula, and here’s to hoping our latest drop of snow (the real thing, not flowery kind) melts quickly and I can get out again and enjoy the snowdrops here. Have a great weekend! I have faith in March this year. I think he’s a changed month and there will be none of the shenanigans he usually throws our way in terms of weather extremes and spring crushing snow loads. I think. It’s only just the first week of course, and this optimism is based entirely on the few hours between Saturday’s snowfall melting off, the sun coming out, above freezing temperatures for just three or so hours, and then the next snowstorm rolling in Sunday afternoon. I was quick to run out though and take a few pictures while the flowers were also feeling optimistic. 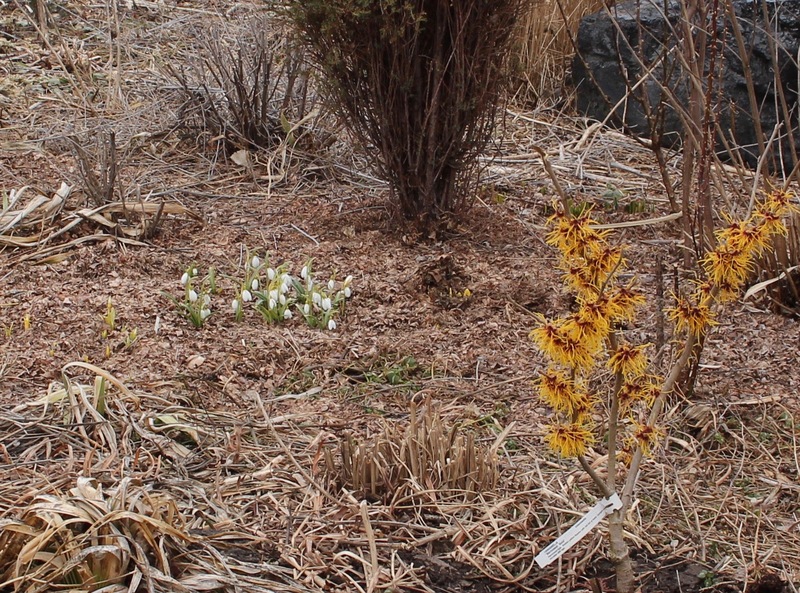 I went ahead (perhaps foolishly) and planted out the new witch hazels in whatever decent, unfrozen, spots I could find. This is ‘Diane’ crammed into a spot close to the street. 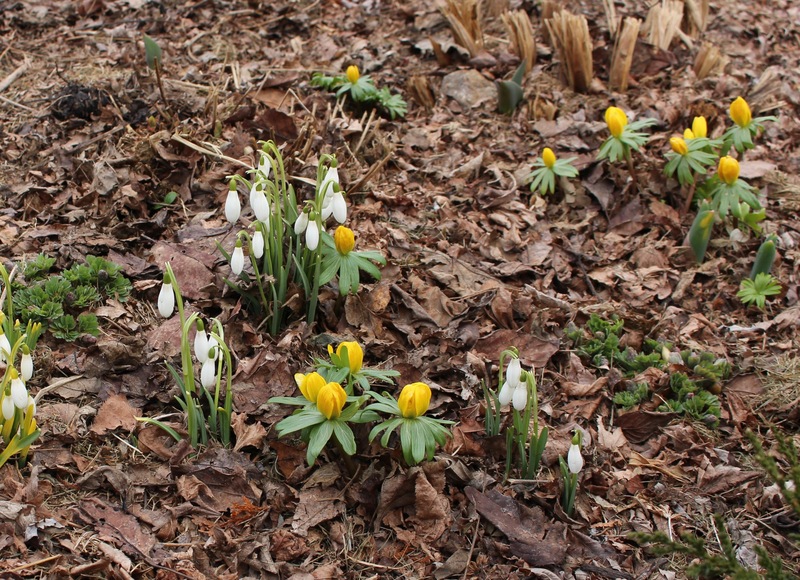 Most of the garden is still fully winter, but if I crop out the patches of snow and focus on the few patches of early snowdrops, winter aconite (Eranthis hyemalis), and witch hazels, well I guess you can have a little hope for spring. This is the time of year which consists of me shuffling back and forth between the same few spots and poking and prodding every last shoot in an attempt to get them to sprout faster. I doubt it helps, but on a “warmer” day I’m out there way more than the weather deserves and I’m sure it rolls some eyes. My neighbor refers to it as ‘you’re out taking pictures of dirt again, aren’t you’ season, and that always reminds me that I should really find a more private spot in the backyard to raise these plants. 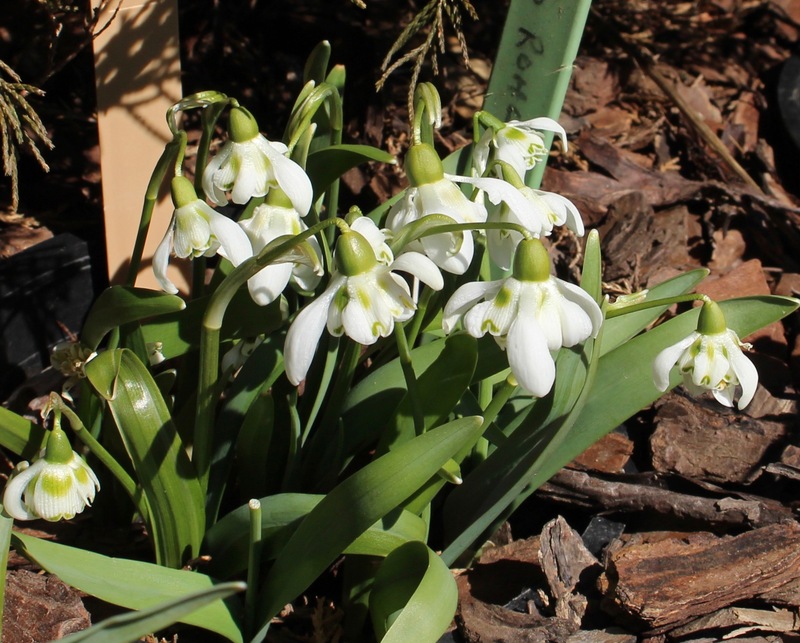 Also in front amongst the shelter of the foundation plantings, galanthus ‘Diggory’ is just coming in to bloom with ‘Wendy’s Gold’ behind. The thrill was short-lived. We ended up with about six inches and although it’s pretty and not all that cold I won’t be sharing any of those pictures. Im huddling indoors and for my plant-fix it’s back to the snow-free, yet underwhelming winter garden in the rear of the garage. The last of the woodshop nonsense is finally out of this area and I’m making it 100% plants. Nothing too exciting going on, but new seeds and cuttings are exciting enough for me, and I’ll show more of that in time. So just a couple more days and I’m sure March will be showing his more personable side. I don’t think I’m asking for too much, just no hailstorms or blizzards this year please. 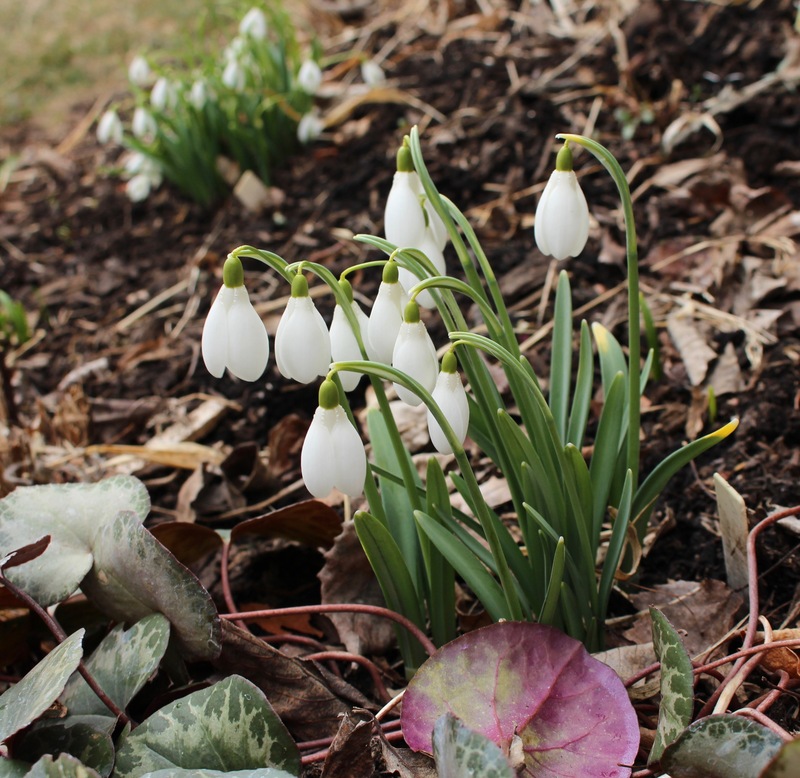 On a side note, this upcoming weekend (Saturday, March 9th) marks the third annual Galanthus Gala, hosted by David Culp of Downingtown Pennsylvania. 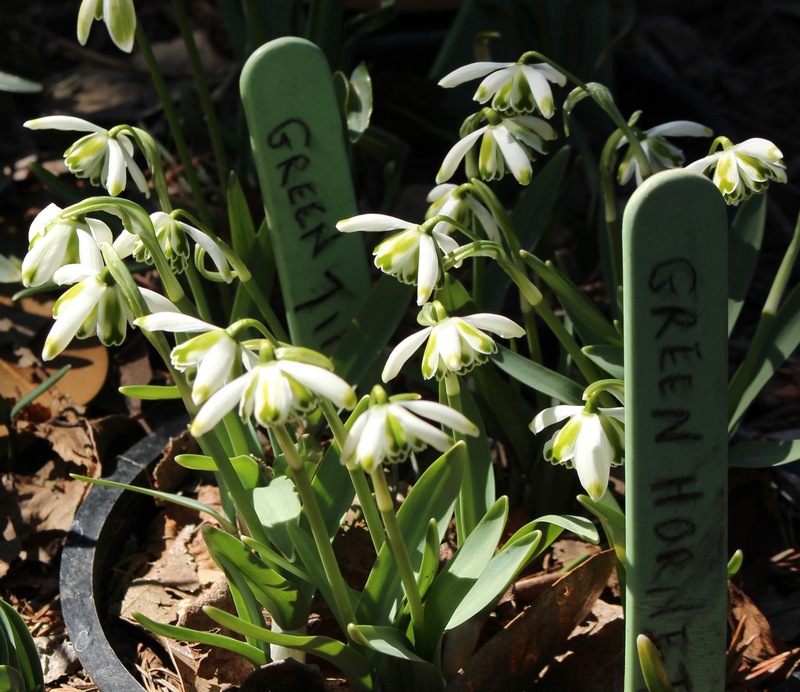 This event is sure to thrill snowdrop lovers and plant lovers in general, and is normally one of the highlights of my late winter snowdrop-a-thon. Alas this year I cannot attend, and the thoughts of missing out on seeing friends and browsing sales tables and talking gardens would have me depressed if I happened to dwell on it too long, so I won’t. I will just recommend that you should go if you can, stop by, rub elbows with the garden obsessed from the US and beyond, sit in for a few talks, and maybe leave with a few new goodies. I hear that besides a healthy supply of snowdrops and such, there will be even more hellebores and also a nice haul of witch hazels this year. Perhaps my wallet will appreciate missing out on more witch hazels but I’m going to be a little crabby about that for a while. In any case, all the best for March and have a great week! Earlier in the week the weather was halfway decent with warmer daytime temperatures, random bits of sunshine, and some hope for spring…. 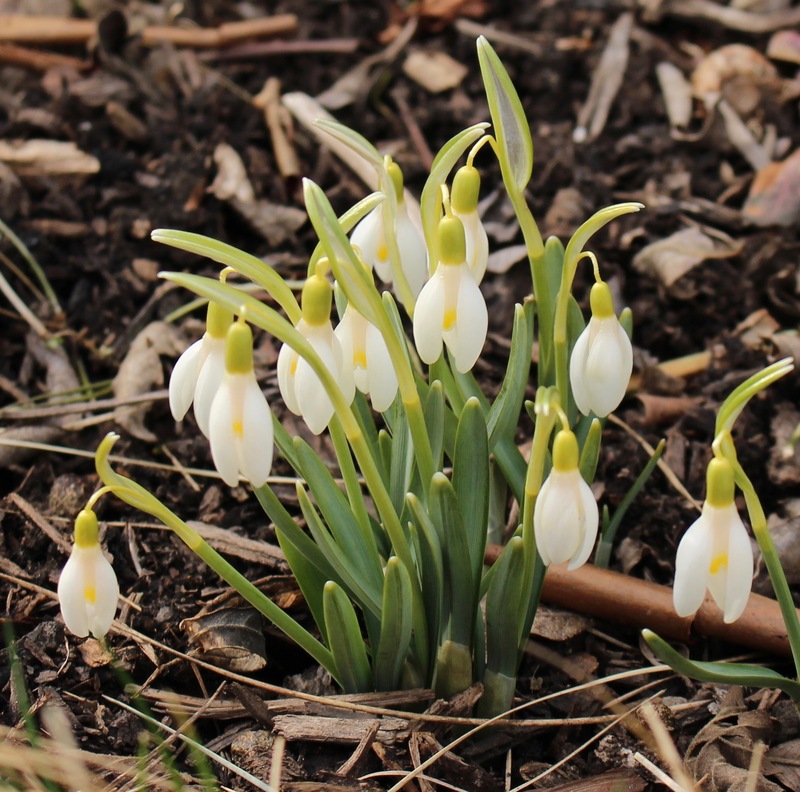 Galanthus ‘Wendy’s Gold’ is the first snowdrop to escape her shroud of ice and brighten up the bleakness. But then things turned messy, with snow and ice and a return to regularly scheduled winter temperatures. By the time Friday rolled around I knew I was in need of escape, so Saturday morning jumped in the car and made the journey down to RareFind Nursery for their Hamamellis festival. I was pleased to see I wasn’t the only one ready for a plant day. Hoophouse #4. Ground zero for the 50 or so witch hazel (Hamamellis) varieties on sale. There was a steady stream of people and plants, and I’m glad I was early enough to get the ones I wanted. In case you’re wondering, Hamamellis are the witch hazels, and you need witch hazels. 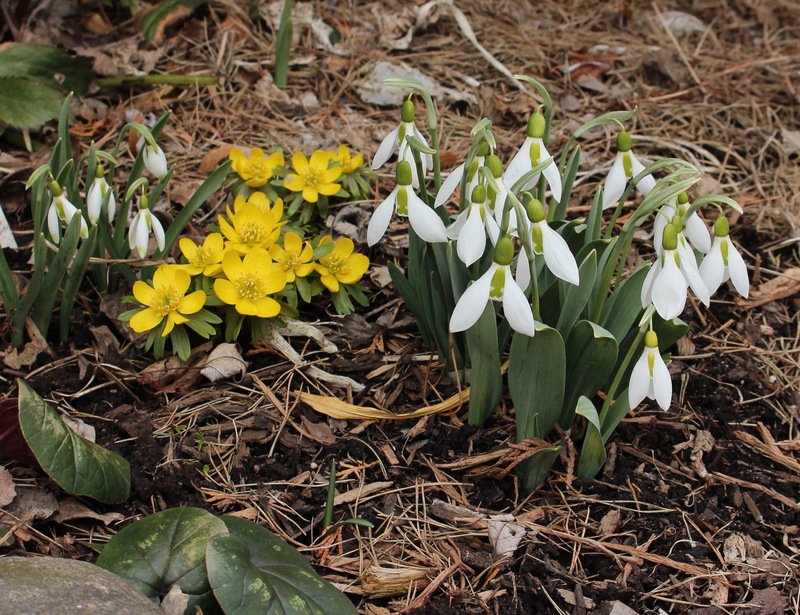 Their winter-defying flowers bring color to a garden still very much in grey mode, and for more northern gardeners there just isn’t much else that even comes close. At this year’s hamamellis festival Steven Kristoph gave an interesting talk on the range and specifics of this plant family, but my lazy take-away was pay attention to bloom time when selecting, plant in decent soil with a little shade from the fiercest sun and they should be trouble free and bring late-winter joy for years to come… even when the crumbling of winter drags on longer than it should. Distracted driving. 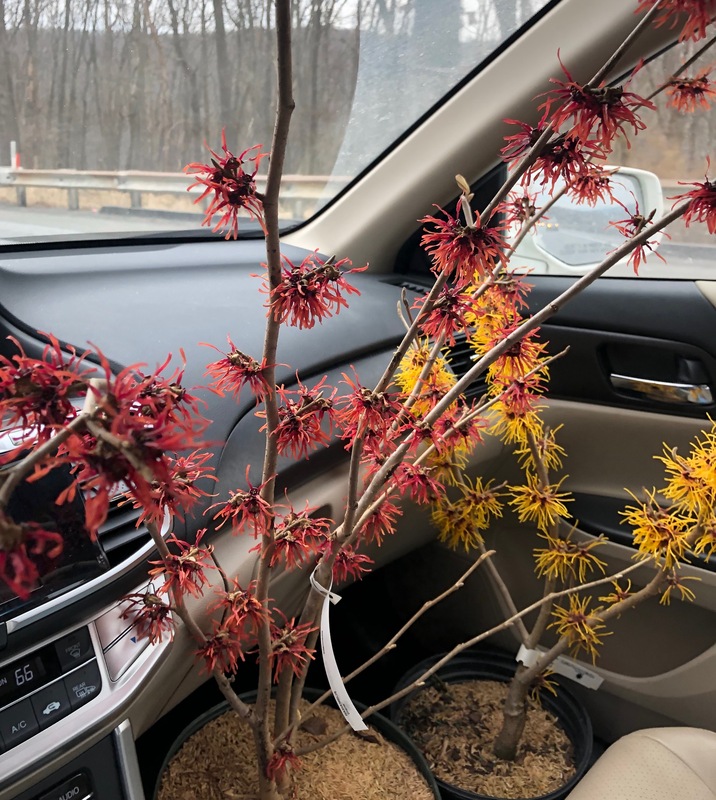 My passengers for the return trip might not have done a good job keeping up their end of the conversation, but they did offer excellent color and a soft fragrance. Was the 300 mile round-trip to New Jersey worth it? Your results may vary, but I say absolutely, and I’m entirely pleased with the goodies which followed me home. There is a week of lows in the teens and just about no days above freezing next week, so I’m between temporarily digging them in pot-and-all outside along the foundation of the house, or bringing them in to the garage for winter garden enjoyment, but that’s a decision for later today. In the meantime I’m avoiding the gloom outside and I hope there’s a little more sunshine and warmth where you are. Have a great week! 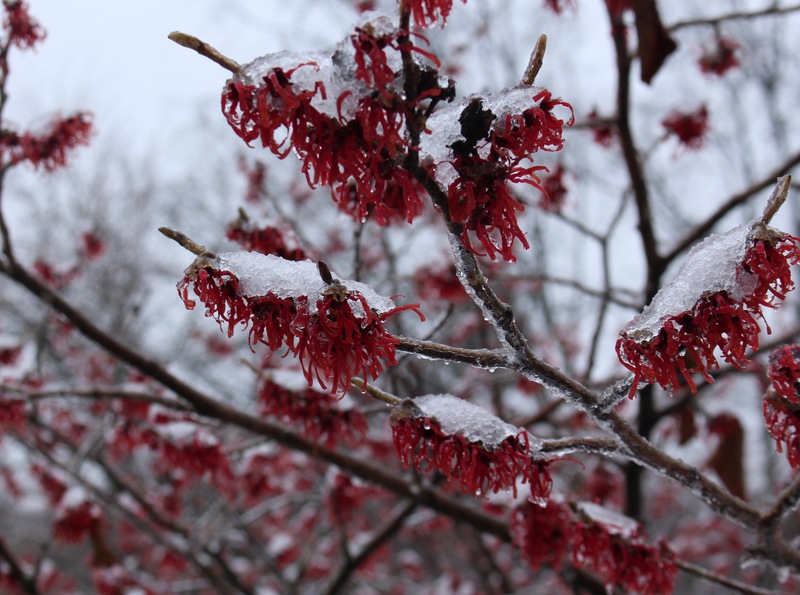 A slow, careful walk up the icy drive gave plenty of time to admire the witch hazels. I believe this is Hamamelis x intermedia ‘Diane’. 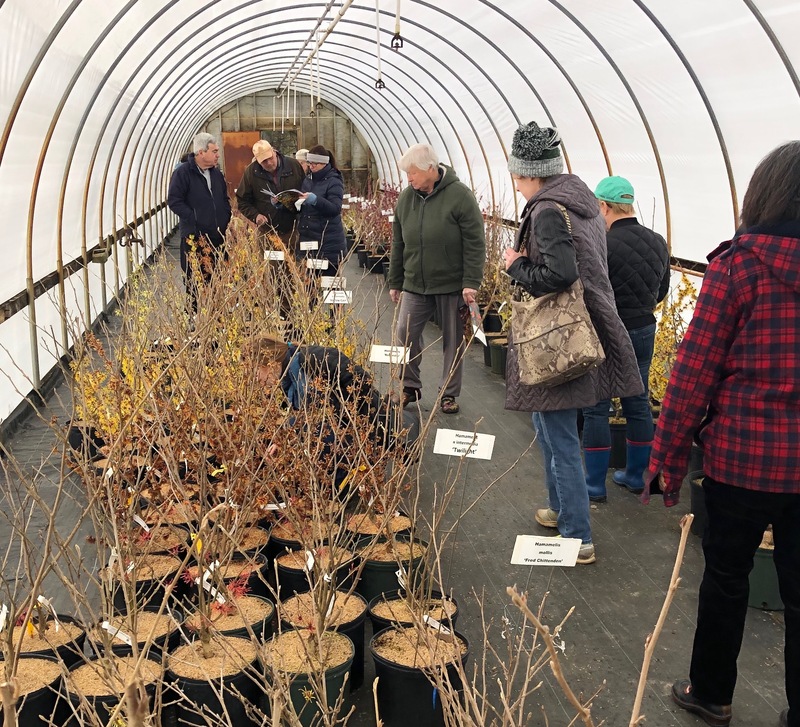 We really had to squeeze this visit in because John Lonsdale, Edgewood Garden’s proprietor, was busy loading up trays and packing the truck for the Pine Knot Hellebore festival in Virginia which kicks off this weekend and then runs for the next three. Lucky you if you’re close enough to visit, but for now the seven and a half hour drive is more than I’m willing to consider… you never know though. It’s on the bucket list. >click here< for exact dates and locations of this and other Edgewood sales events. My friend Paula met up with us and we had a great morning looking at and talking about just about any and all snowdrop nuances you could think of. Then we talked about cyclamen. As usual I overstayed my welcome. 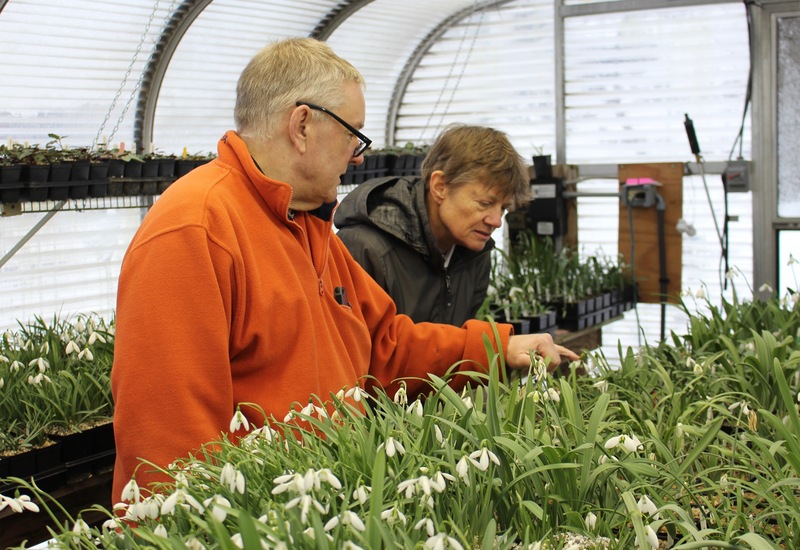 John and Paula working their way through the G. plicatus section of snowdrops. I honestly intended to take pictures of some of the latest and greatest hybrids and named sorts and share the photos here, but I really do get a little overwhelmed when hit with the variety of species John grows. 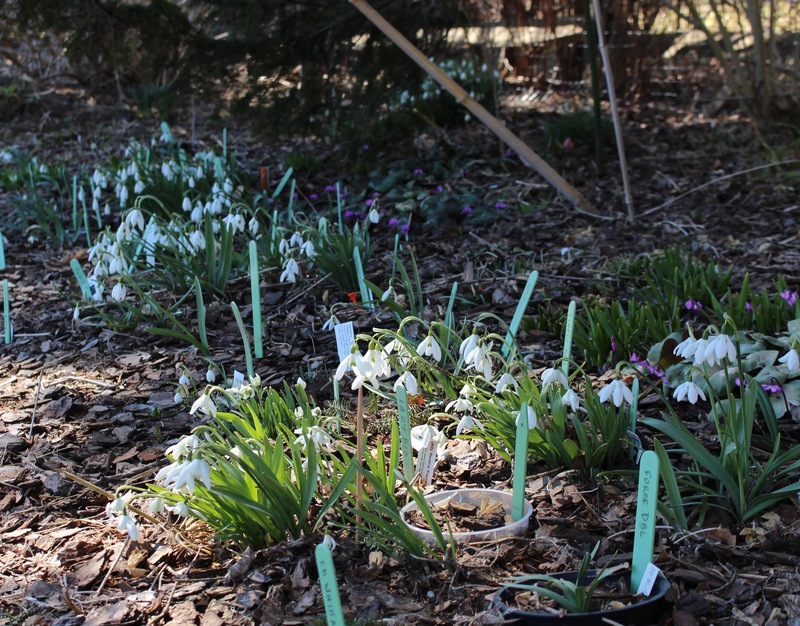 If you’d like a more focused report I’d recommend clicking >here< to read the recent Washington Post article on Edgewood Gardens and some of John’s work with several of the rarest snowdrop sorts. Just one of the many pots which made me say “oh look at this one, I like that too”. 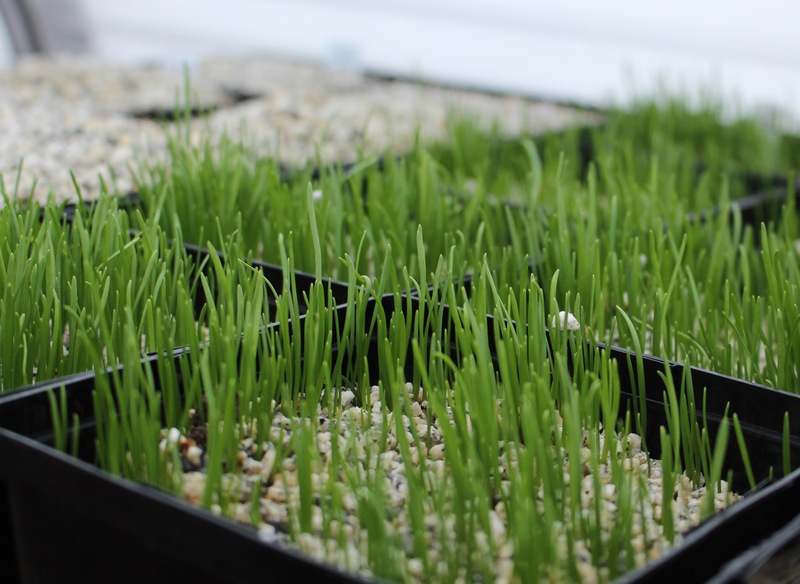 I believe these were all G. gracilis seedlings. Of course I like galanthus for the flowers as much as anyone else, but for some reason the varied foliage of the snowdrops had me distracted on this visit. 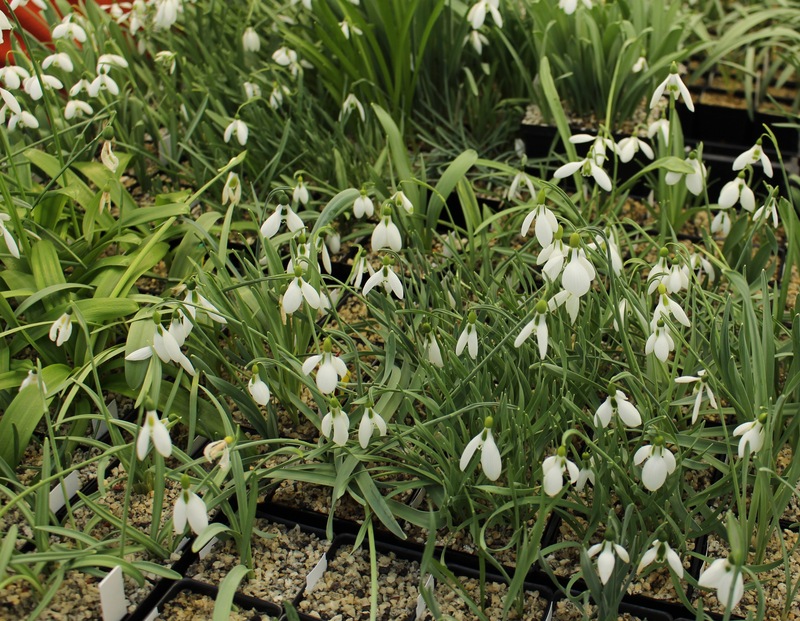 Various pots of Galanthus ikarie seedlings. Such nice foliage, some big flowers here and there, and even one with a nice flush of green on the petal tips. There weren’t just a few species. I asked which ones in particular he had growing in the greenhouses and his response was just “all of them”. 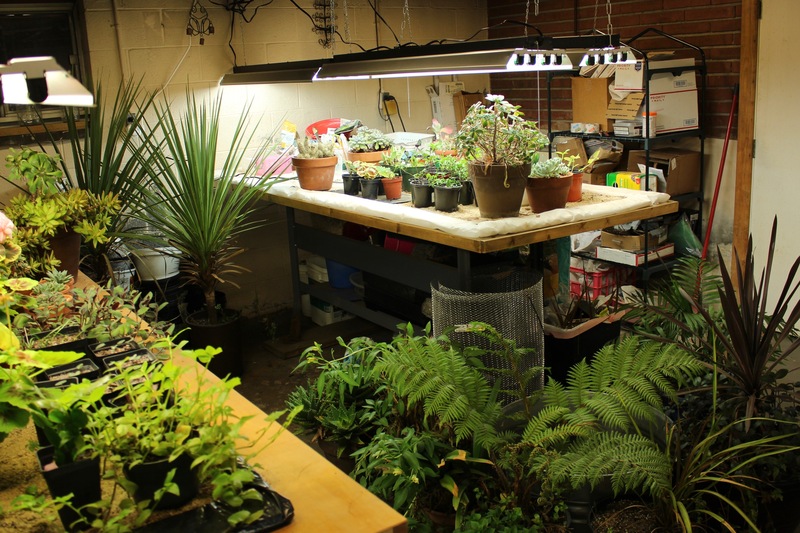 It was very cool to see, but even that was overshadowed by the thousands of snowdrop seedlings coming up on nearly every spare shelf or extra rack. 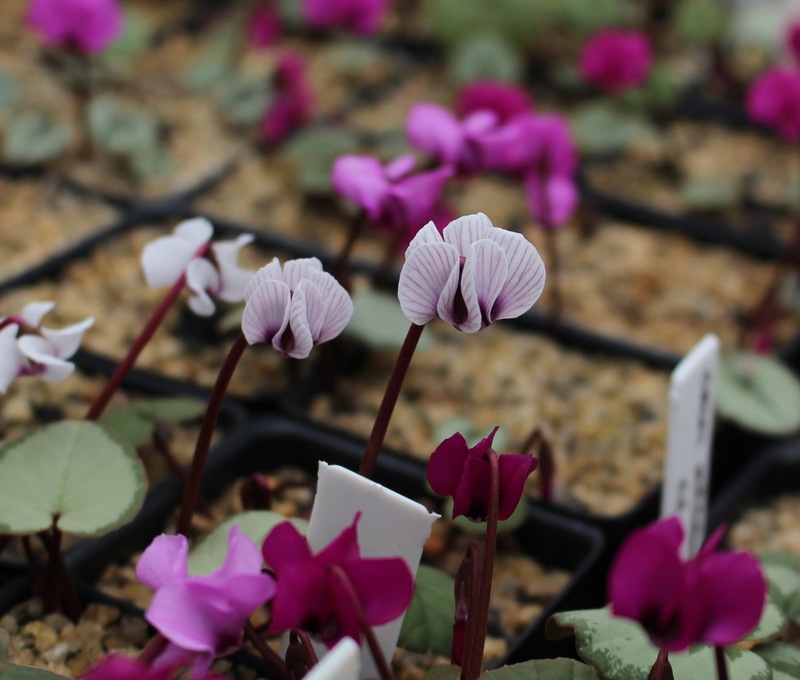 The incredible diversity of species coming along is staggering but before I was even able to get myself grounded again it was off to the next greenhouse to check in on some hardy cyclamen. Cyclamen coum filling the bench with an exceptional range of forms and colors. 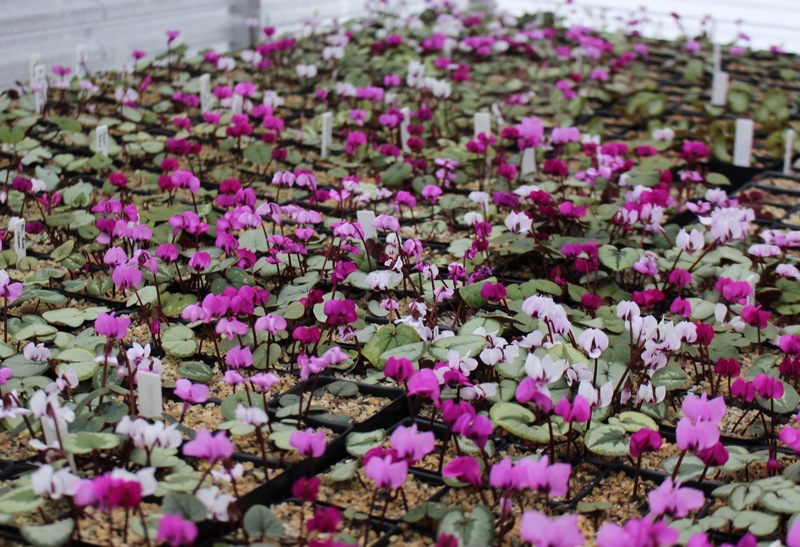 I took this visit as an opportunity to correct the severe lack of cyclamen coum which my indoor garden is dealing with this winter. For those who need to know, my budget only allowed me to pick four new ones, so you needn’t worry that I made a huge dent in his offerings. Cyclamen coum ‘Porcelain’, a nicely striped special strain he had coming along, as well as a particularly dark form below it. Speaking of budgets, since last year was such a success in restraint and control, I’ve decided to leave off on a good note and never mention tracking my gardening costs again. It seems almost pointless to worry about a few dollars here and there when I’m faced each month with writing the checks to put a ten year old girl through gymnastics. All my gardening budget is now officially part of my health care budget, and that would be mental health specifically. Spending money on the garden will hopefully distract me from the endless drain of money going towards filling birthday cards and financing icecream shoppes and filling the belly of a twelve year old boy who always seems inches from famine. 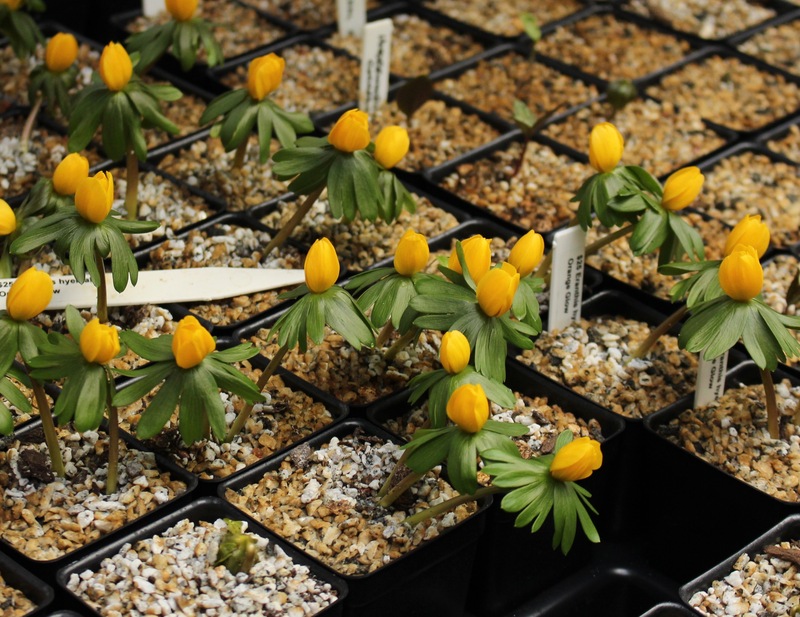 Another Edgewood offering this year, ‘Orange Glow’ winter aconite (Eranthis hiemalis). I could have easily added a few of these to my order, but have to keep faith that my little seedling from a previous year is still just waiting to show itself. As long as we’re talking about the budget I wasn’t going to talk about, I might as well admit this visit wasn’t all just the usual me inviting myself over to look at plants. 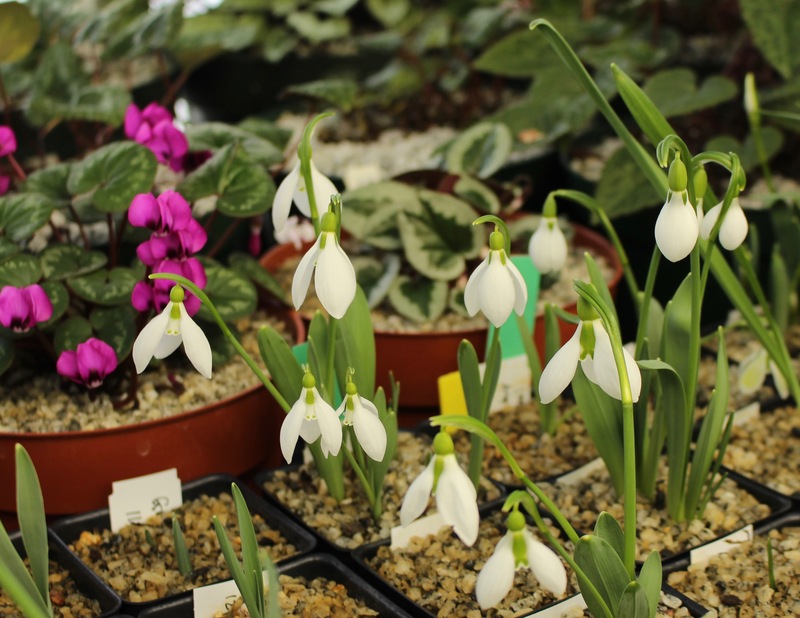 John has put out a spring listing of plants and I may have needed to pick up a few snowdrops as well as my new cyclamen. It can be found >here< and although I did save on shipping by picking up directly, you may choose to avoid a five hour roundtrip through snow and icy roads, and just have them mailed to your doorstep. 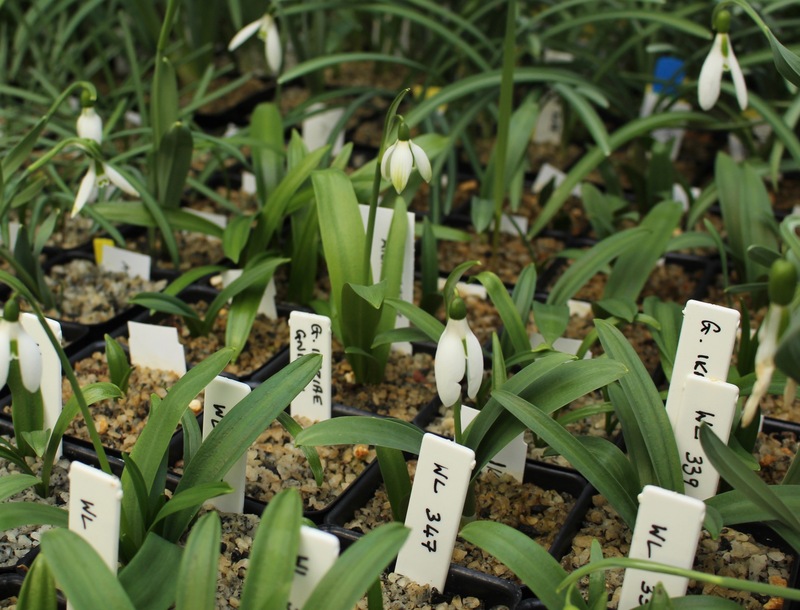 A large flowered Galanthus plicatus seedling. 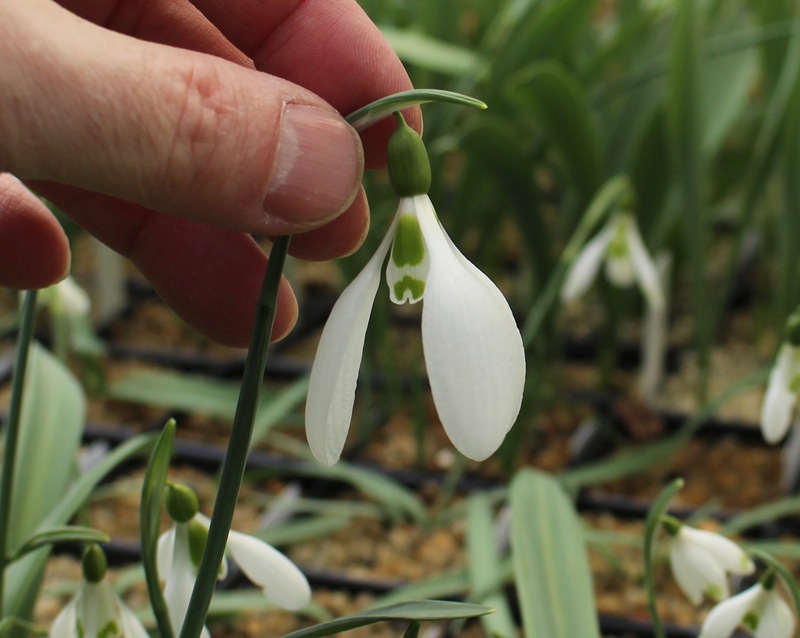 The rule of thumb here is about one inch for that particularly fat digit, and that puts this well endowed snowdrop at over two inches! As always it was a great time, and even though the walk out went even more slowly with precious cargo in hand, we still took a few more minutes to again admire the optimistic witch hazels lining the drive. 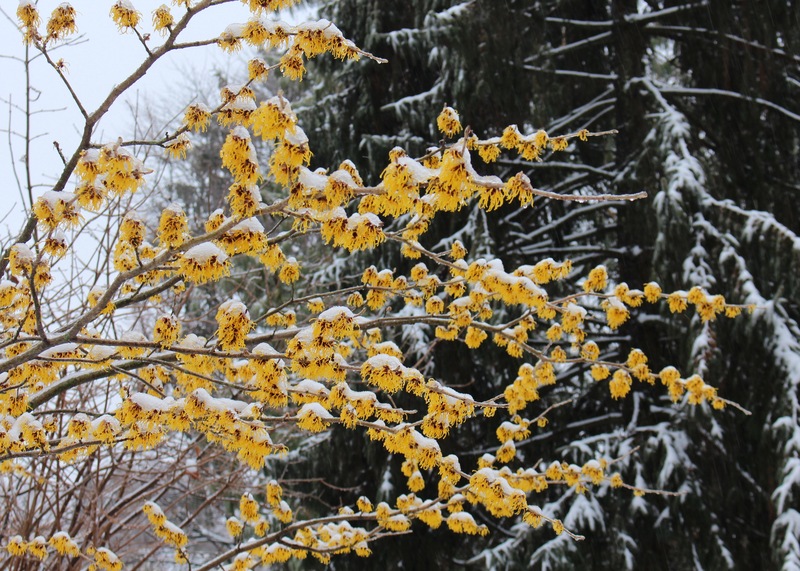 Icy witch hazel (Hamamelis × intermedia ‘Barmstedt Gold’) in full bloom despite the sub-freezing temperatures. Everyone should have a few of these. Have a great week, and judging by the strength of the sun this morning you can probably guess what my next post will feature heavily!